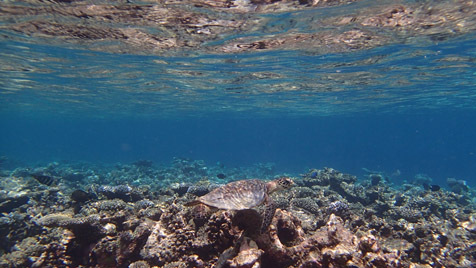 The Maldives is a group of islands (coral atolls) Southwest of Sri Lanka. 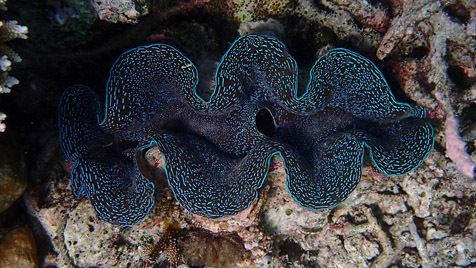 The country consist of an archipelago 823 km long from North to South and 130 km at its greatest width. 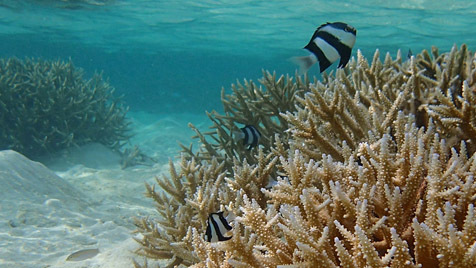 There are about 1200 islands that make up the country with the highest point only 2.4 meters above sea level. 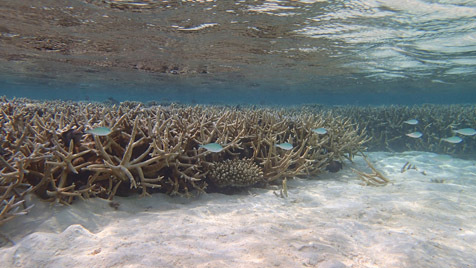 About 200 of the islands are inhabited, with around 100 developed for tourist resorts. 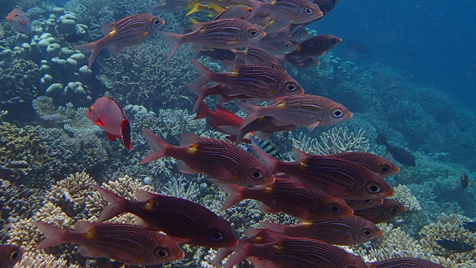 The country has a population of about 400,000 people, with Islam as the official religion. 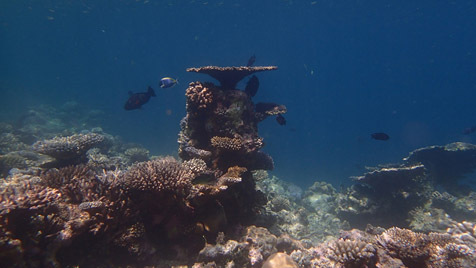 Open practice of any other religion other than Islam is forbidden and liable to prosecution. 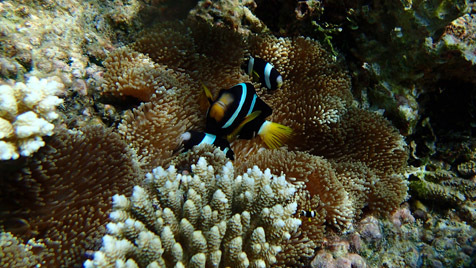 Malé is the capital of the Maldives. 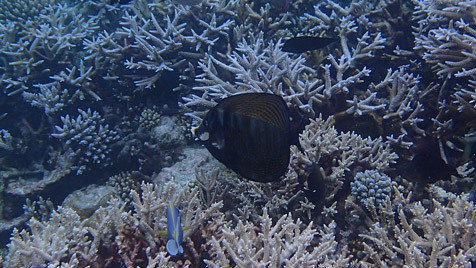 The Malé International Airport is on an island East of Malé. 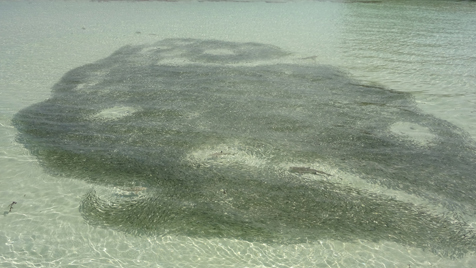 The island also has a sea port for seaplanes that take passengers to many resorts throughout the Maldives. 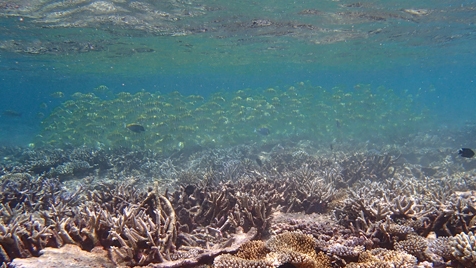 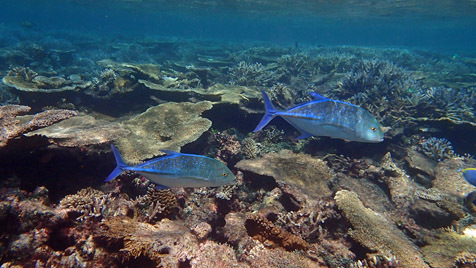 Many of the resorts do not allow fishing on the resort reefs which provides for the most pristine reefs I have ever had the opportunity to explore. 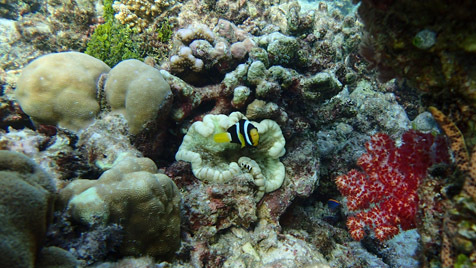 The resorts cater to eco tourist that enjoy snorkeling and scuba diving. 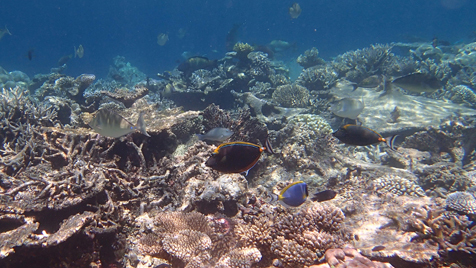 On this trip we stayed and explored the reef of Mirihi and Athuruga Islands in the Ari atoll group of the Maldives. 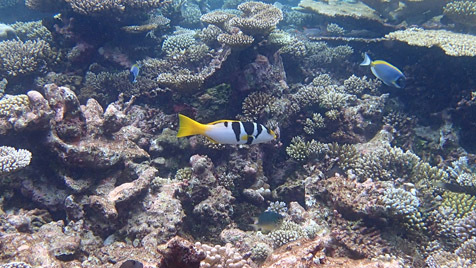 To get to our resorts in the Maldives we flew from San Francisco to Dubai, and from Dubai to Malé. 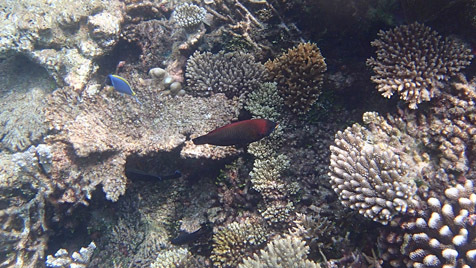 From Malé we took a seaplane to Mirihi. 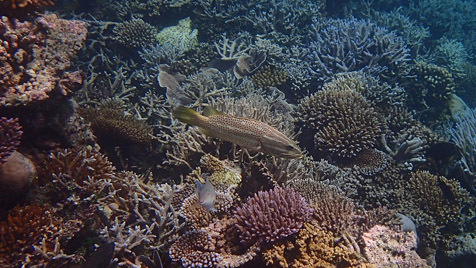 From Mirihi to Athuruga we took a resort boat. 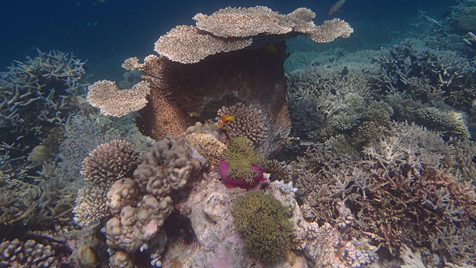 Our return back to the states required a seaplane from Athuruga to Malé. 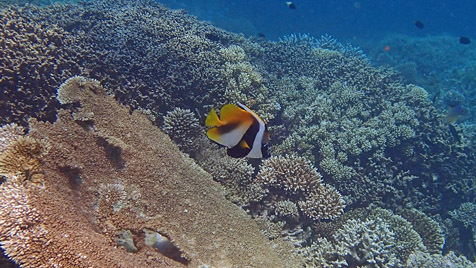 From Malé back to Dubai, then to San Francisco. 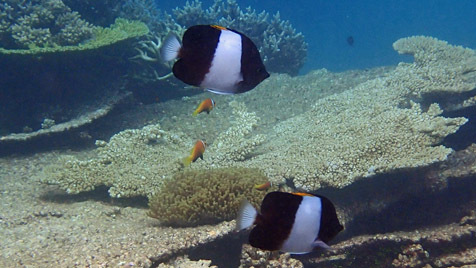 Being that the Maldives is located in the middle of the Indian Ocean, you will find some unique marine fish that are not found on Pacific reefs. 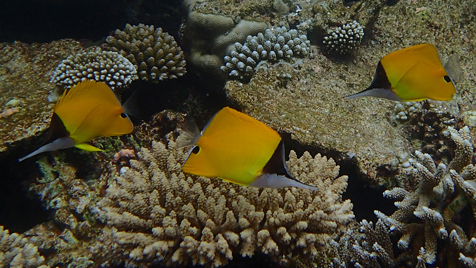 Blonde orange-spine surgeon fish (Naso elegans), powder blue tang (Acanthurus leucosternon), yellowhead butterflyfish (Chaetodon xanthocephalus), and black finned clownfish (Amphiprion nigripes) are common on the reefs. 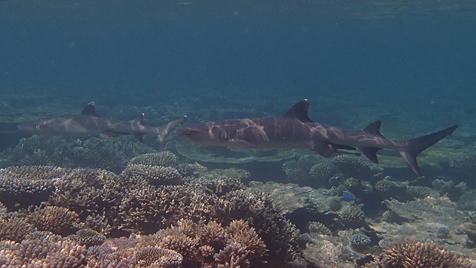 Black-tip (Carcharhinus melanopterus) and white-tip reef sharks (Triaenodon obesus) are often seen on the reefs. 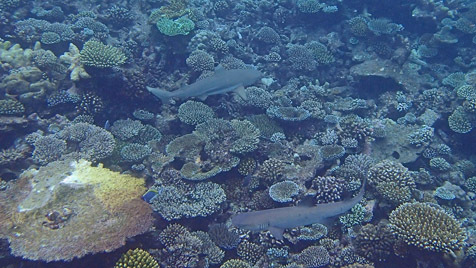 At Mirihi Island you can observe the black-tip reef sharks hunting fish gathered in large shoals in water less than 2 feet (60 cm) deep. 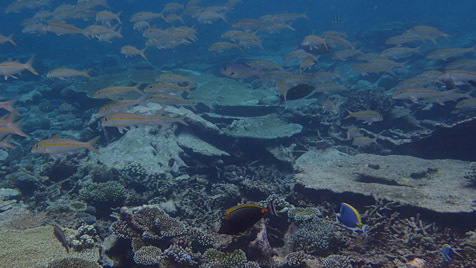 Large shoals of parrotfish and tangs are common on the reefs. 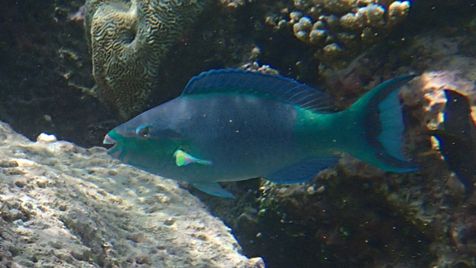 Several large parrotfish species are also common on the reefs. 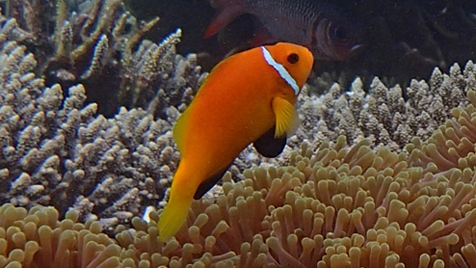 Only two species of anemonefish are found on the reefs, Amphiprion nigripes and Amphiprion clarkii. 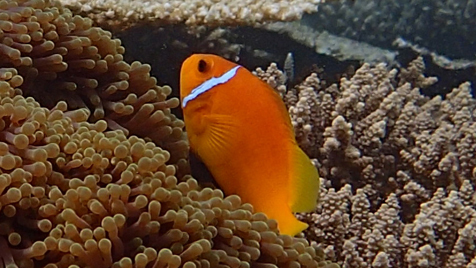 Anemonefish are normally found on the outer reef slopes, with the ritteri anemone (Heteractis magnifica) being the most common host for A. nigripes. 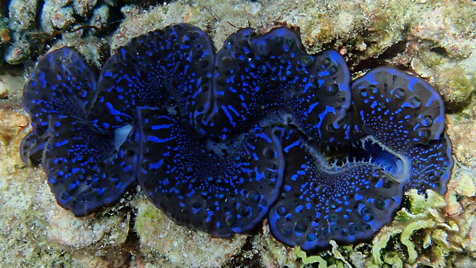 Heteractis magnifica were always found in small to large groups, with many separate groups usually within 30 feet (10 meters) of each other. 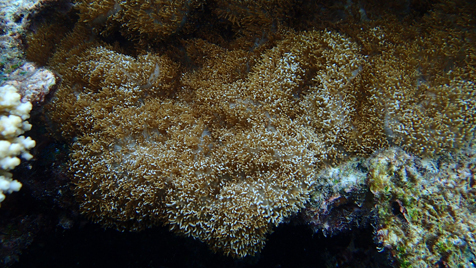 Normally Heteractis magnifica is found at depths between 10 feet (3 m) to 30 feet (10 m). 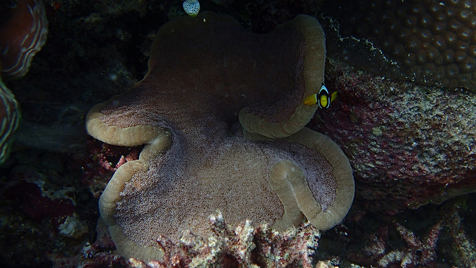 Two other species of anemones are commonly associated with A. clarkii, Merten's carpet (Stichodactyla mertensii), and adhesive anemone (Cryptodendrum adhaesivum). 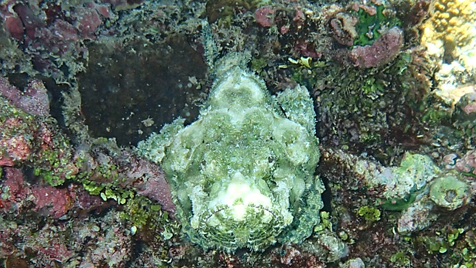 Stichodactyla mertensii is found at depths between 6 feet (2 m) to 20 feet (6 m). 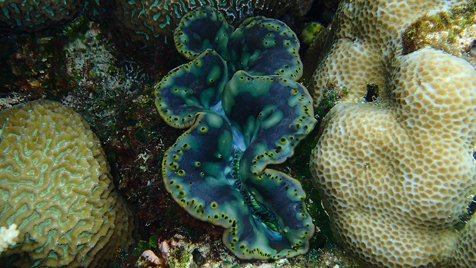 Cryptodendrum adhaesivum is normally found at depths between 3 feet (1 m) to 6 feet (2 m). 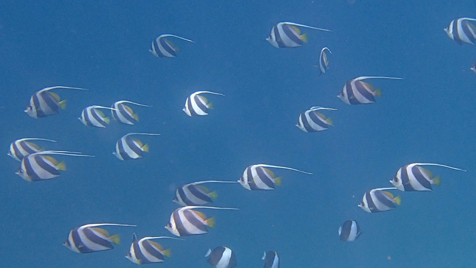 All of the underwater photos and videos were taken with an Olympus TG-1 or TG-2 waterproof camera. 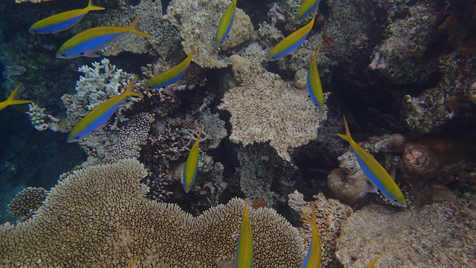 A few videos and pictures were taken with a Sony Cyber-shot DSC-WX9. 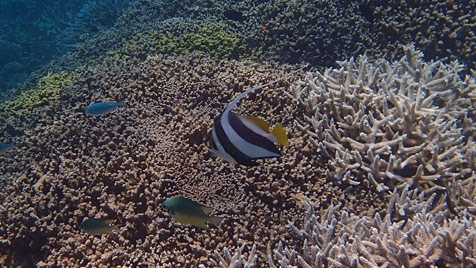 Reef video shot at Athuruga and Mirihi Islands, Maldives. 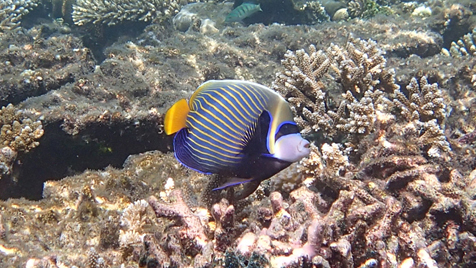 Recorded with Olympus TG-2 by Tony Griffitts in May 2014. 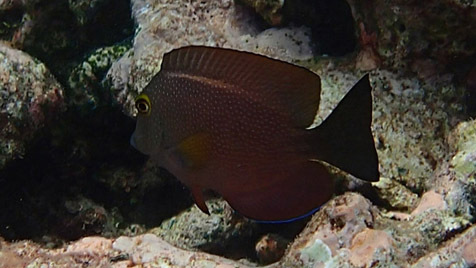 Abudefduf vaigiensis (Indo-Pacific sergeant) normally found on the outer reef slope plankton picking. 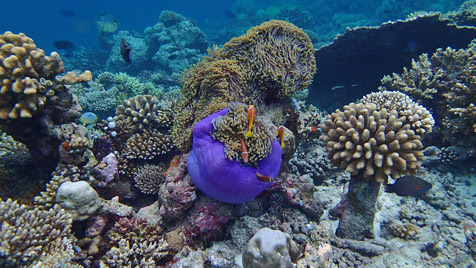 Mirihi Island, Maldives. 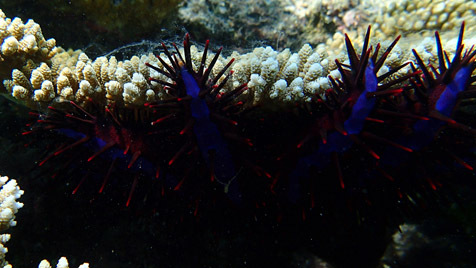 Acanthaster planci (crown-of-thorns starfish), Athuruga Island, Maldives. 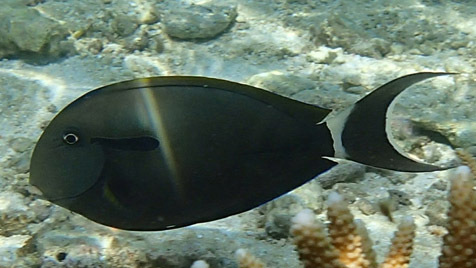 Acanthurus nigricauda (epaulette surgeonfish or tang), Mirihi Island, Maldives. 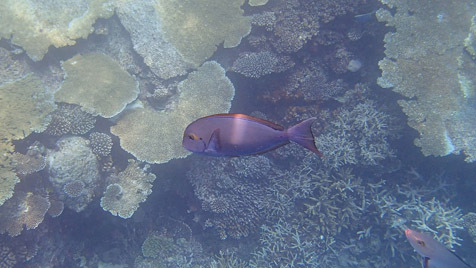 Acanthurus leucosternon (powder blue tang) being cleaned by Labroides bicolor (bicolor cleaner wrasse), Mirihi Island, Maldives. 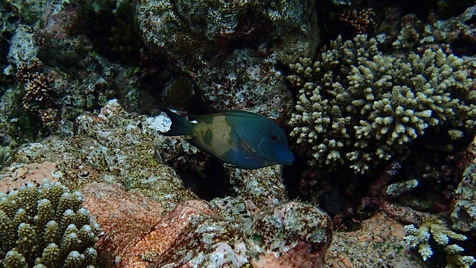 Acanthurus leucosternon (powder blue tang), Mirihi Island, Maldives. 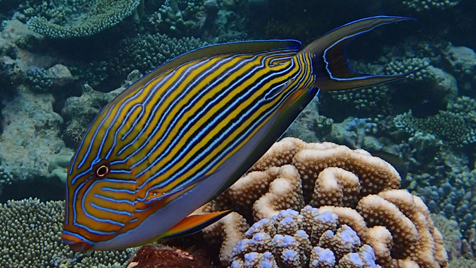 Acanthurus lineatus (clown tang), Mirihi Island, Maldives. 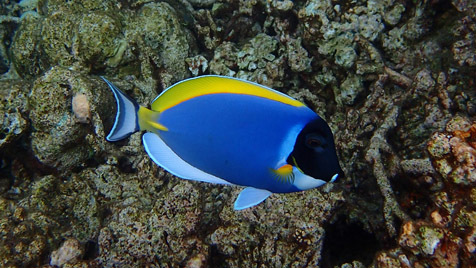 Acanthurus mata (yellowmask surgeonfish), Mirihi Island, Maldives. 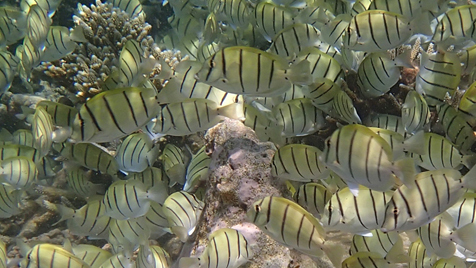 Acanthurus triostegus (convict tang), Athuruga Island, Maldives. 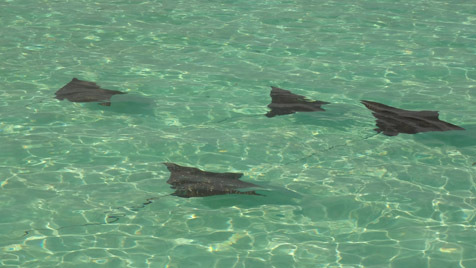 Aetobatus narinari (spotted eagle ray), Athuruga Island, Maldives. 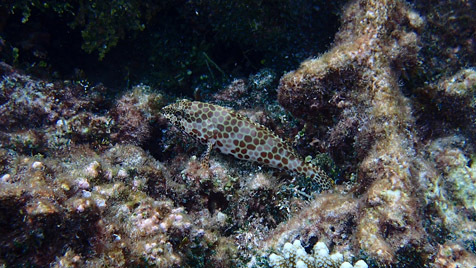 Aluterus scriptus (scrawled filefish), Athuruga Island, Maldives. 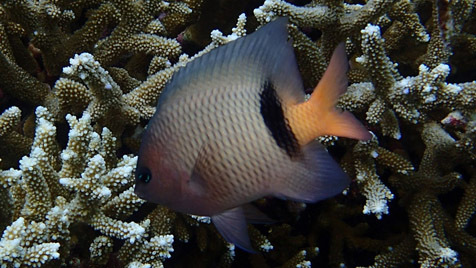 Amblyglyphidodon batunai (batuna damselfish). 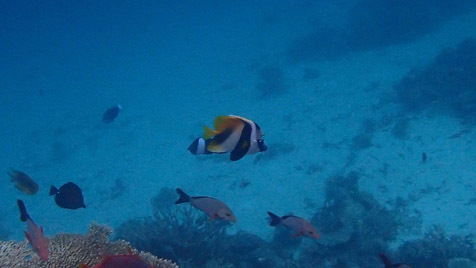 Mirihi Island, Maldives. 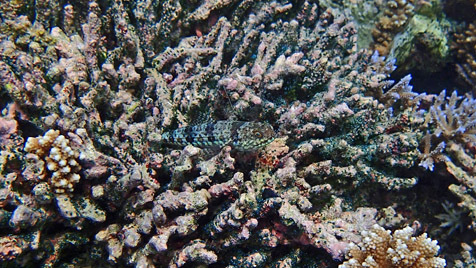 Amblygobius semicinctus (half-barred goby), Mirihi Island, Maldives. 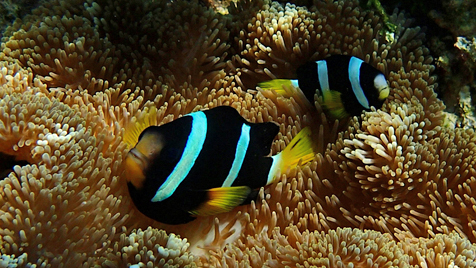 Amphiprion clarkii (Clark's clownfish) with Stichodactyla mertensii (Merten's carpet anemone), Athuruga Island, Maldives. 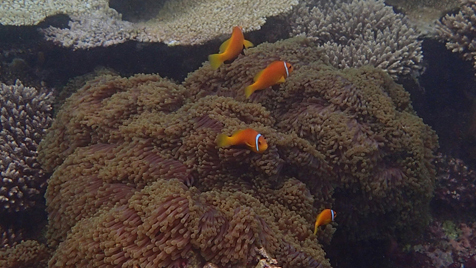 Amphiprion nigripes (Maldives anemonefish or blackfinned anemonefish or clownfish) with Heteractis magnifica (magnificent ritteri anemone), Mirihi Island, Maldives. 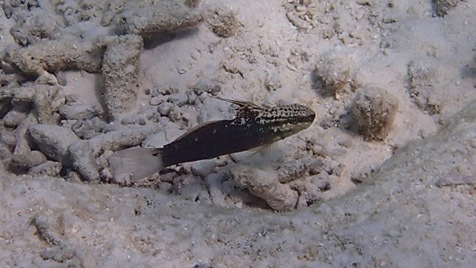 Anyperodon leucogrammicus (slender grouper), Mirihi Island, Maldives. 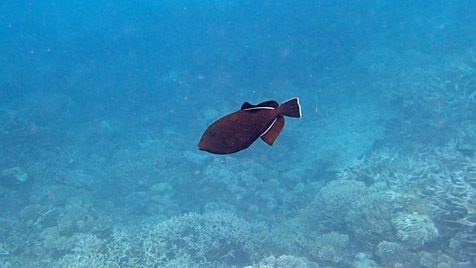 Anyperodon leucogrammicus (slender grouper), Athuruga Island, Maldives. 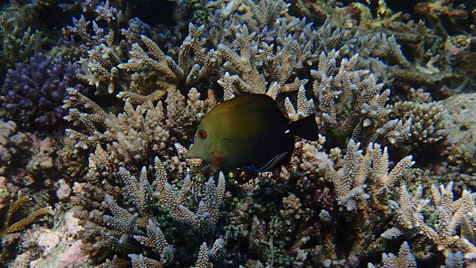 Apolemichthys trimaculatus (flagfin angelfish), Mirihi Island, Maldives. 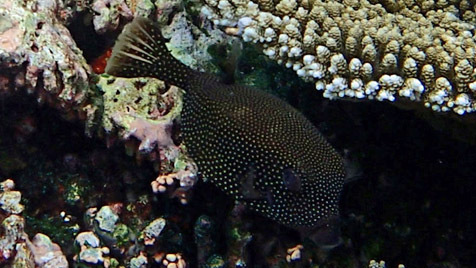 Arothron nigropunctatus (dog-face puffer), Mirihi Island, Maldives. 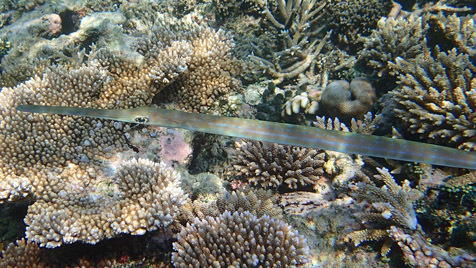 Aulostomus chinensis (Chinese trumpetfish), Athuruga Island, Maldives. 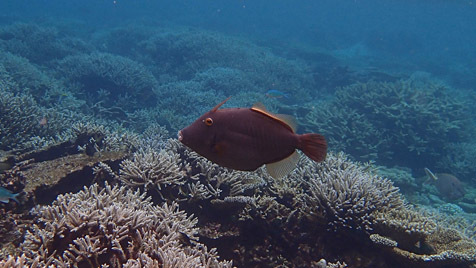 Balistapus undulatus (orange-lined triggerfish), Athuruga Island, Maldives. 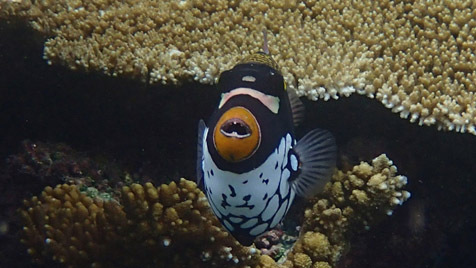 Balistoides conspicillum (clown triggerfish), Mirihi Island, Maldives. 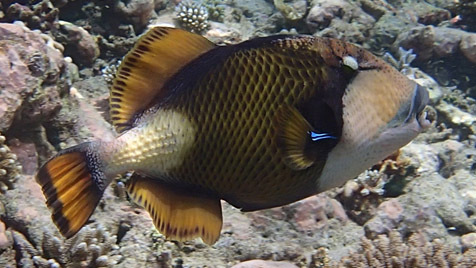 Balistoides viridescens (titan triggerfish) has its gills cleaned by Labroides dimidiatus (cleaner wrasse), Mirihi Island, Maldives. 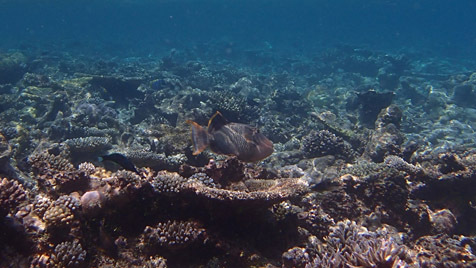 Balistoides viridescens (titan triggerfish) moving a large rock with coral growing on it to get to invertebrates that may be underneath, Athuruga Island, Maldives. 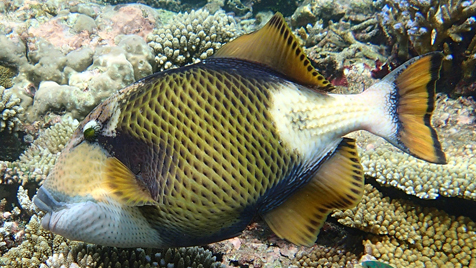 Balistoides viridescens (titan triggerfish), Mirihi Island, Maldives. 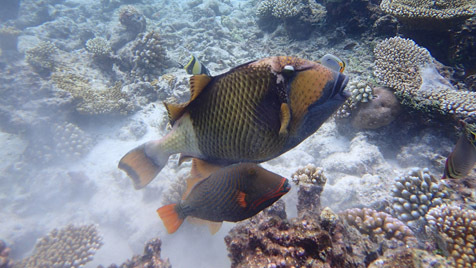 Balistoides viridescens (titan triggerfish) with a full size adult Balistapus undulatus (orange-lined triggerfish), Athuruga Island, Maldives. 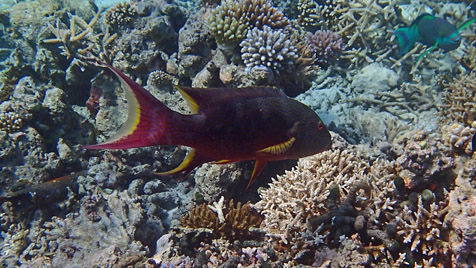 Bodianus mesothorax (coral hogfish), Athuruga Island, Maldives. 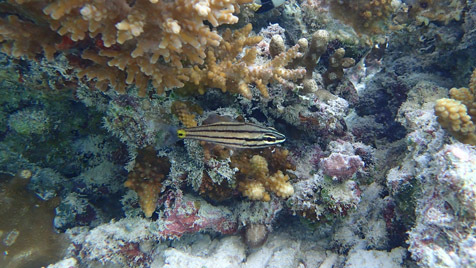 Caesio striata (striated fusilier), Mirihi Island, Maldives. 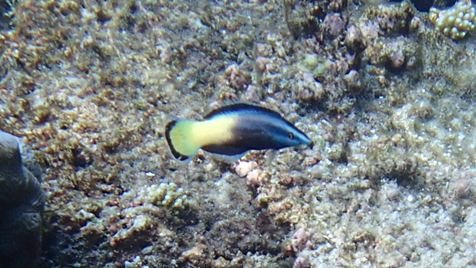 Caesio xanthonota (yellowback fusilier), Mirihi Island, Maldives. 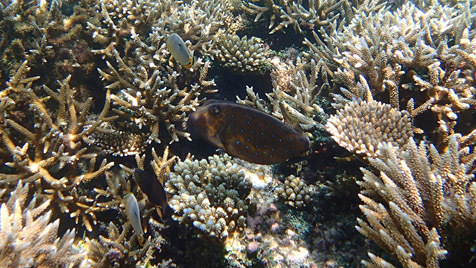 Cantherhines dumerilii (barred filefish), Mirihi Island, Maldives. 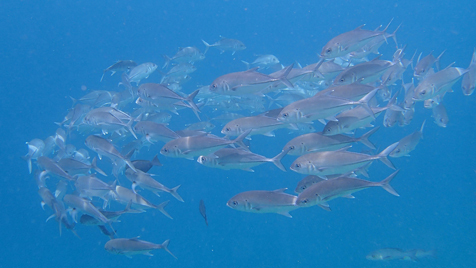 Caranx melampygus (bluefin trevally), Mirihi Island, Maldives. 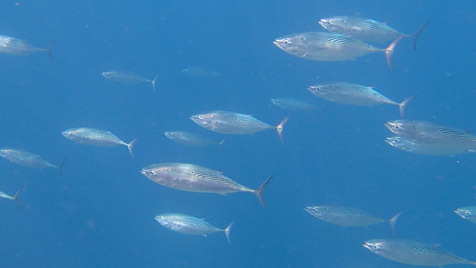 Caranx melampygus (bluefin trevally), Athuruga Island, Maldives. 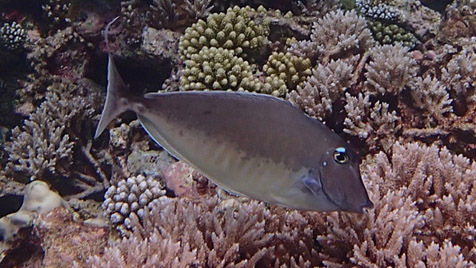 Caranx sexfasciatus (bigeye trevally), Mirihi Island, Maldives. 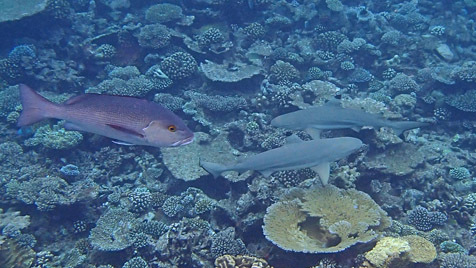 Carcharhinus melanopterus (blacktip reef shark) with Lutjanus bohar (two-spot red snapper) in the foreground, , Mirihi Island, Maldives. 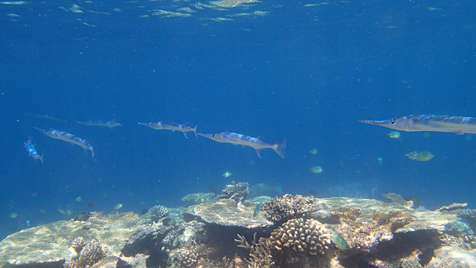 Carcharhinus melanopterus (blacktip reef shark) and Triaenodon obesus (white-tip reef shark), Mirihi Island, Maldives. 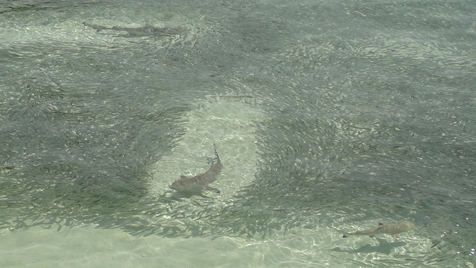 Carcharhinus melanopterus (blacktip reef shark), Mirihi Island, Maldives. 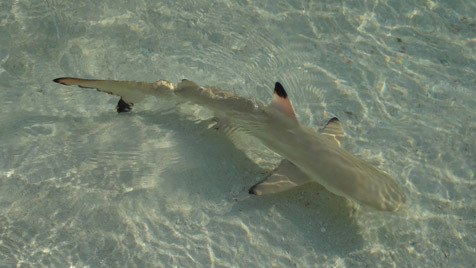 Carcharhinus melanopterus (blacktip reef shark) feeding. 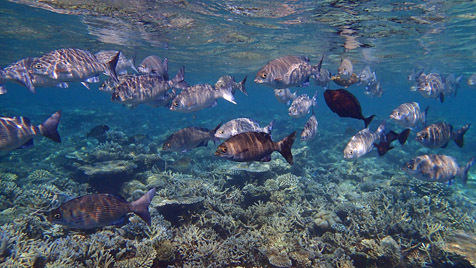 Mirihi Island, Maldives. 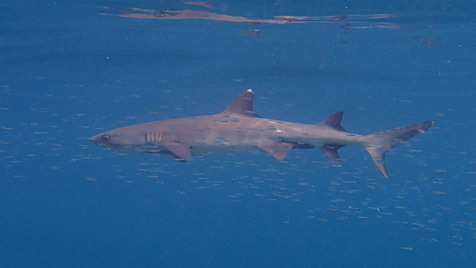 Carcharhinus melanopterus (blacktip reef shark). 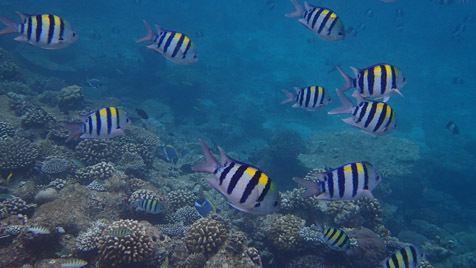 Mirihi Island, Maldives. 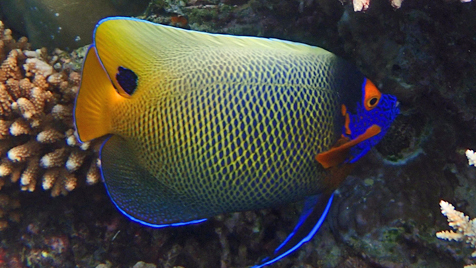 Centropyge multispinis (bluefin dwarf angelfish), Athuruga Island, Maldives. 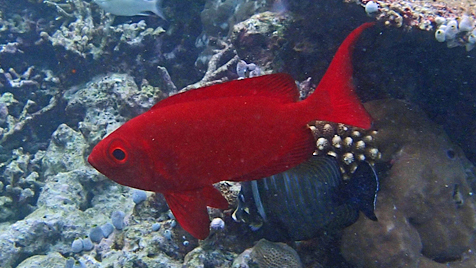 Cephalopholis argus (peacock grouper), Athuruga Island, Maldives. 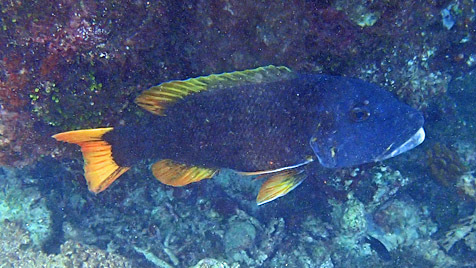 Cephalopholis argus (peacock grouper), Mirihi Island, Maldives. 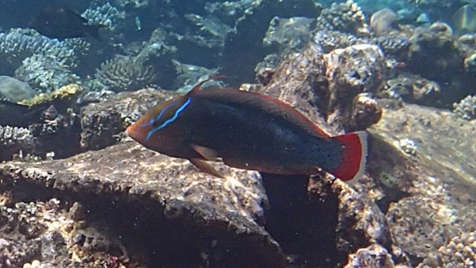 Cetoscarus bicolor (male bicolor parrotfish), Mirihi Island, Maldives. 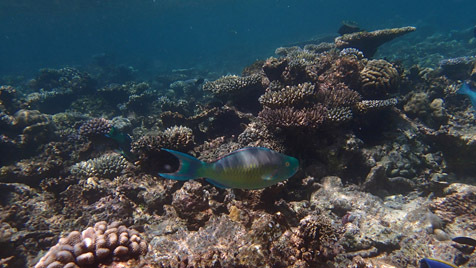 Cetoscarus bicolor (female bicolor parrotfish), Athuruga Island, Maldives. 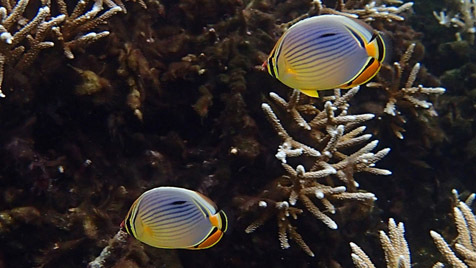 Chaetodon auriga (auriga butterflyfish), Athuruga Island, Maldives. 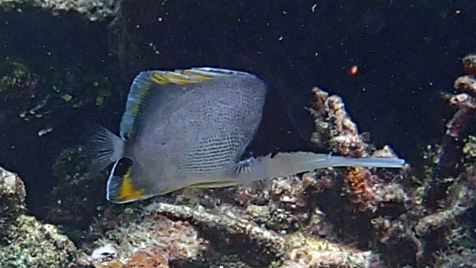 Chaetodon bennetti (bennett butterflyfish), Mirihi Island, Maldives. 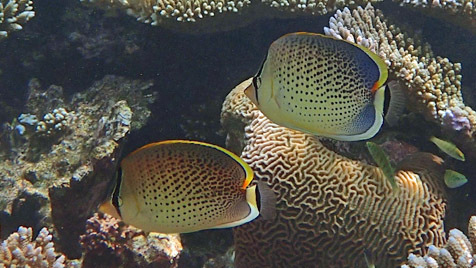 Chaetodon citrinellus (speckled butterflyfish), Athuruga Island, Maldives. 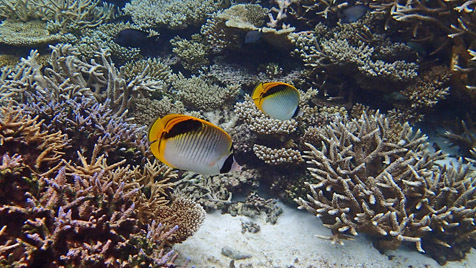 Chaetodon falcula (blackwedged butterflyfish) , Mirihi Island, Maldives. 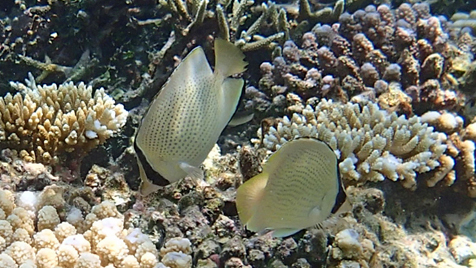 Chaetodon guttatissimus (peppered butterflyfish), Mirihi Island, Maldives. 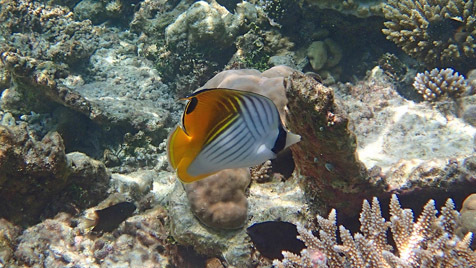 Chaetodon kleinii (Klein's butterflyfish), Athuruga Island, Maldives. 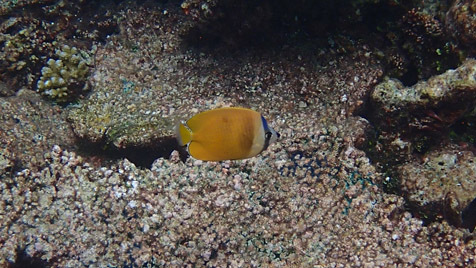 Chaetodon kleinii (Klein's butterflyfish), Mirihi Island, Maldives. 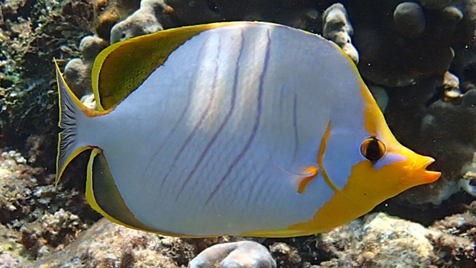 Chaetodon lunula (racoon butterflyfish), Athuruga Island, Maldives. 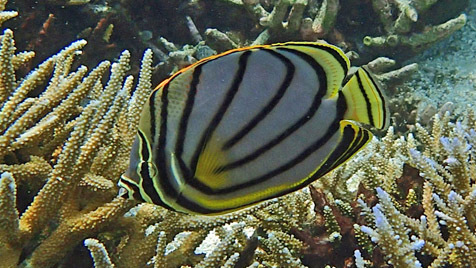 Chaetodon melannotus (blackback butterflyfish), Athuruga Island, Maldives. 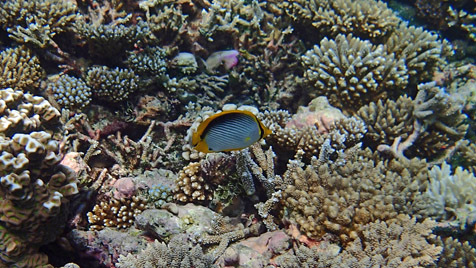 Chaetodon meyeri (scrawled butterflyfish), Mirihi Island, Maldives. 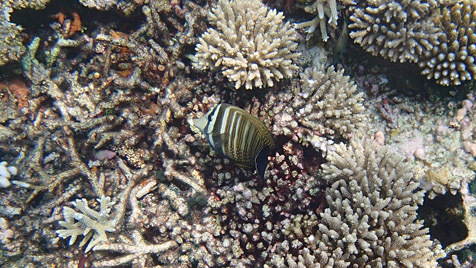 Chaetodon oxycephalus (spot-nape butterflyfish), Mirihi Island, Maldives. 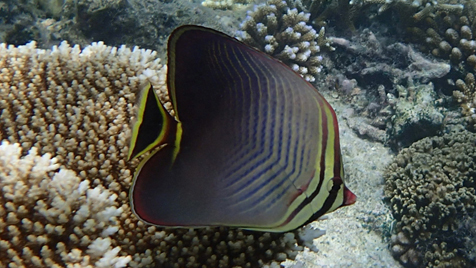 Chaetodon triangulum (triangular butterflyfish), Athuruga, Maldives. 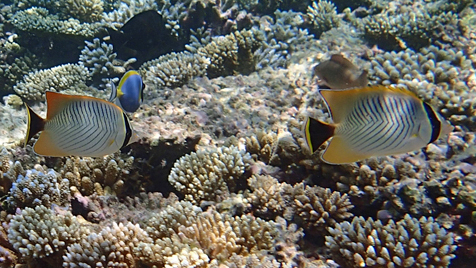 Chaetodon trifascialis (chevron butterflyfish), Athuruga Island, Maldives. 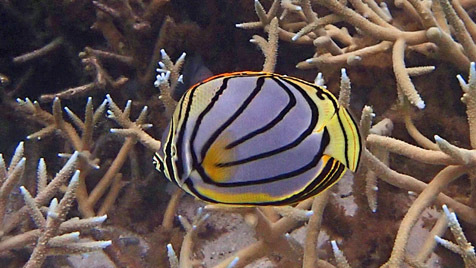 Chaetodon trifasciatus (melon butterflyfish), Mirihi Island, Maldives. 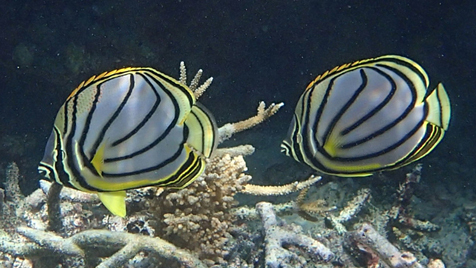 Chaetodon xanthocephalus (yellowhead butterflyfish), Athuruga Island, Maldives. 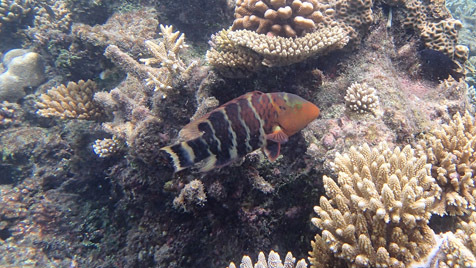 Cheilinus fasciatus (red-breasted wrasse), Athuruga Island, Maldives. 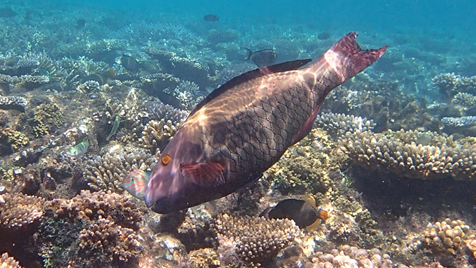 Cheilinus trilobatus (tripletail Maori wrasse), Athuruga Island, Maldives. 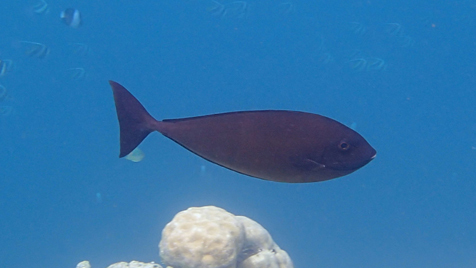 Cheilinus undulatus (juvenile hump-head or Napoleon wrasse), Athuruga, Maldives. 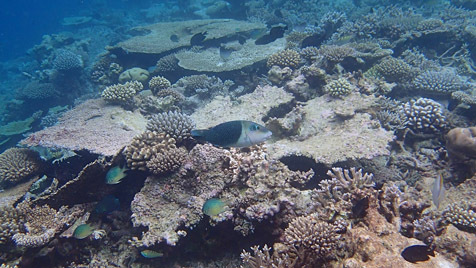 Cheilinus undulatus (juvenile hump-head or Napoleon wrasse), Mirihi, Maldives. 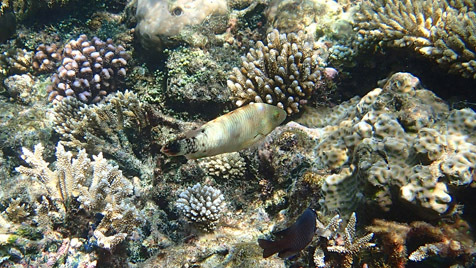 Cheilodipterus quinquelineatus (five-lined cardinalfish), Athuruga Island, Maldives. 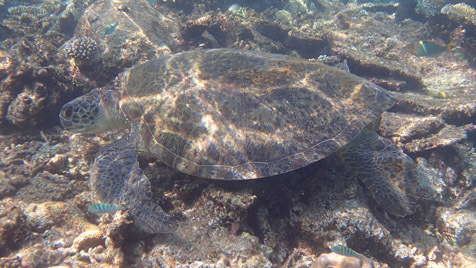 Chelonia mydas (green sea turtle), Athuruga Island, Maldives. 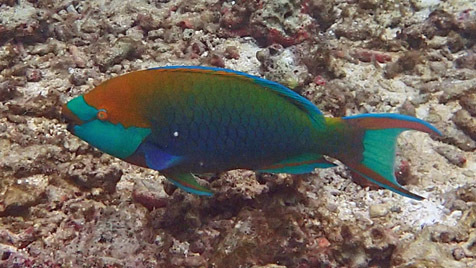 Chlorurus enneacanthus (captain parrotfish), Athuruga Island, Maldives. 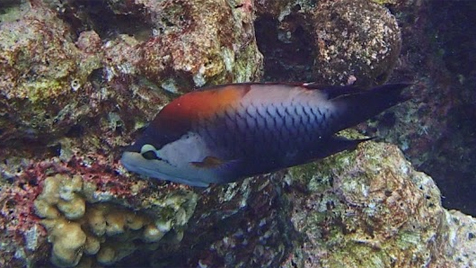 Chlorurus gibbus (heavybeak parrotfish, male), Mirihi Island, Maldives. 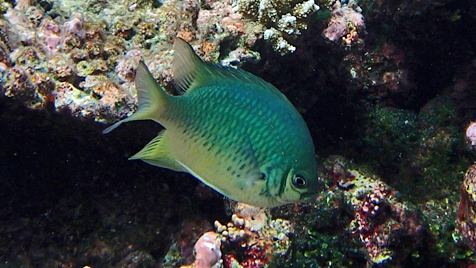 Chlorurus gibbus (heavybeak parrotfish, female), Mirihi Island, Maldives. 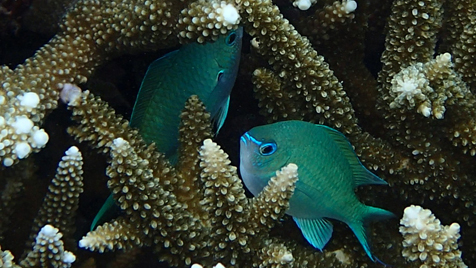 Chromis atripectoralis (black-axil chromis), Mirihi Island, Maldives. 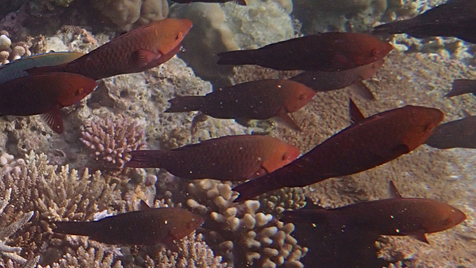 Coris formosa (queen coris wrasse), Athuruga, Maldives. 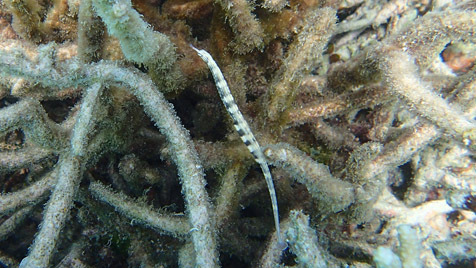 Corythoichthys intestinalis (scribbled pipefish), Mirihi Island, Maldives. 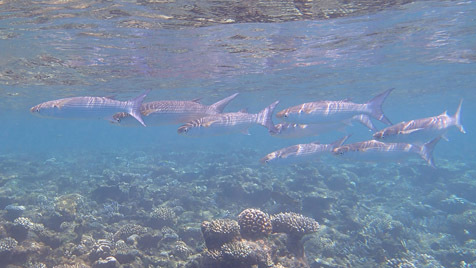 Crenimugil crenilabis (fringelip mullet), Athuruga Island, Maldives. 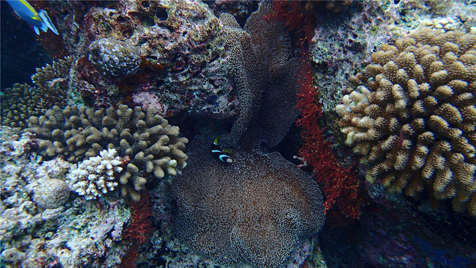 Amphiprion clarkii (juvenile Clark's clownfish) with Cryptodendrum adhaesivum (adhesive, or pizza Anemone), Athuruga Island, Maldives. 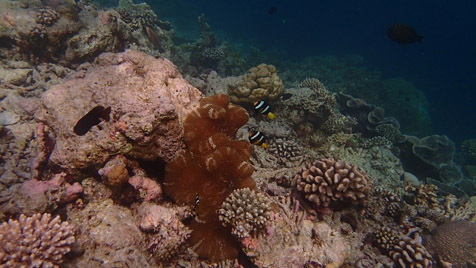 Amphiprion clarkii (Clark's clownfish) with Cryptodendrum adhaesivum (adhesive, or pizza anemone), Athuruga Island, Maldives. 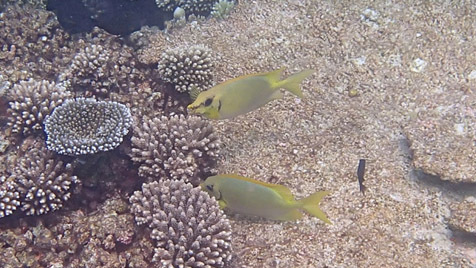 Ctenochaetus striatus (a rare mutation of a striated surgeonfish), Mirihi Island, Maldives. 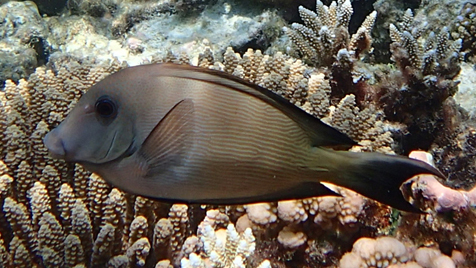 Ctenochaetus striatus (striated surgeonfish), Mirihi Island, Maldives. 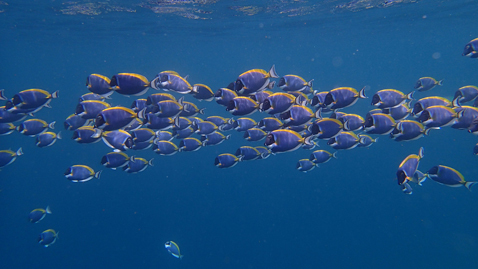 Ctenochaetus striatus (striated surgeonfish), Athuruga Island, Maldives. 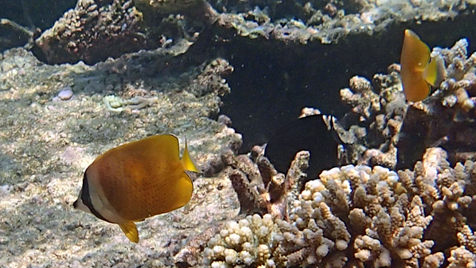 Ctenochaetus striatus (striped bristletooth tang), Athuruga Island, Maldives. 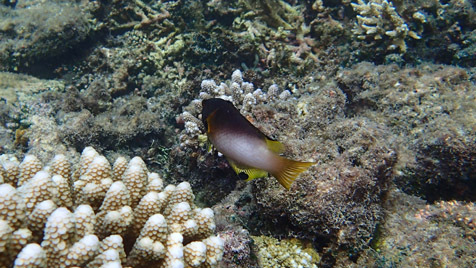 Ctenochaetus truncatus (Indian gold ring bristletooth or spotted yellow eye tang), Mirihi Island, Maldives. 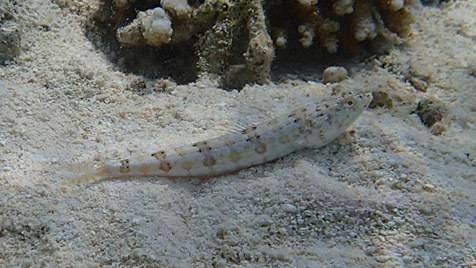 Ctenogobiops feroculus (sandy prawn-goby), Athuruga Island, Maldives. 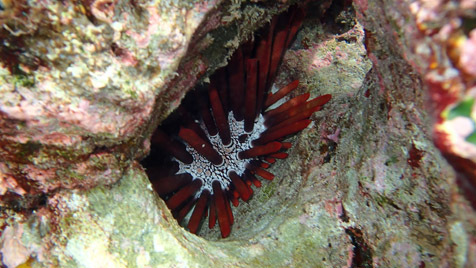 Culcita schmideliana (pincushion sea star), Athuruga Island, Maldives. 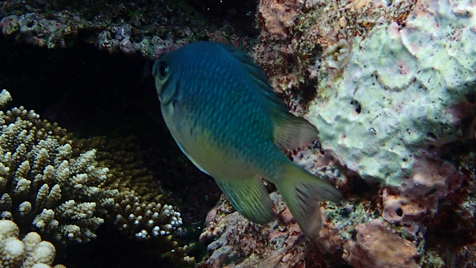 Dascyllus aruanus (three-stripe damselfish), Mirihi Island, Maldives. 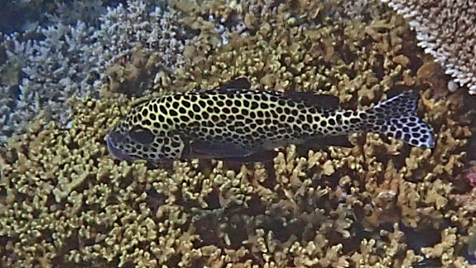 Diodon liturosus (black-blotched porcupinefish), Mirihi Island, Maldives. 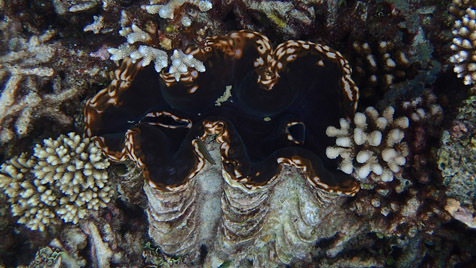 Discosoma rhodostoma (brown hairy mushroom anemones), Mirihi Island, Maldives. 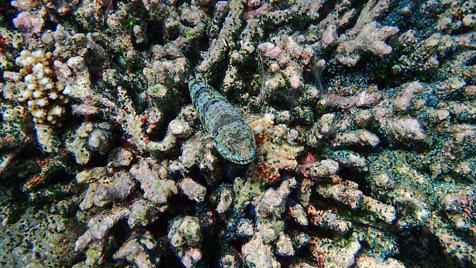 Ecsenius minutus (combtooth blenny), Athuruga Island, Maldives. 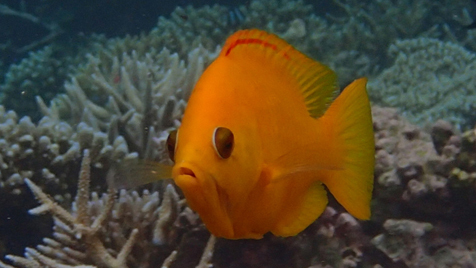 Epibulus insidiator (yellow phase female sling-jaw wrasse), Mirihi, Maldives. 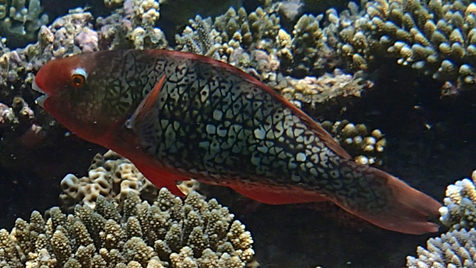 Epibulus insidiator (male sling-jaw wrasse), Mirihi Island, Maldives. 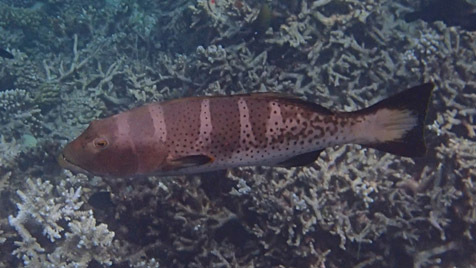 Epinephelus hexagonatus (starspotted grouper), Athuruga Island, Maldives. 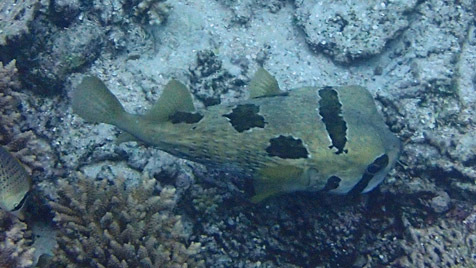 Epinephelus malabaricus (?) 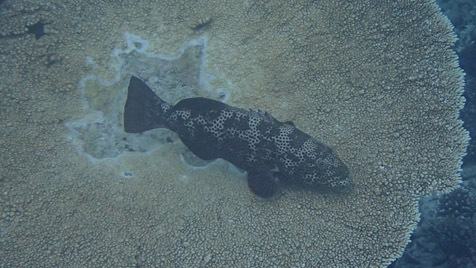 (malabar grouper), Athuruga Island, Maldives. 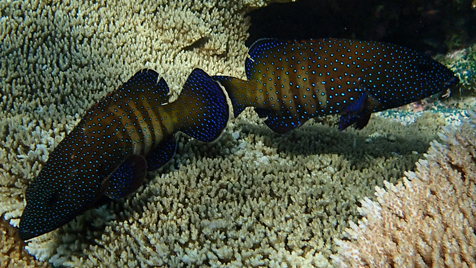 Epinephelus merra (honeycomb grouper), Athuruga Island, Maldives. 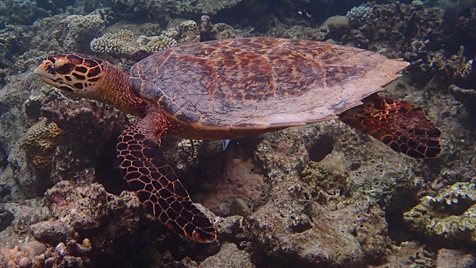 Eretmochelys imbricata (hawksbill sea turtle), Mirihi Island, Maldives. 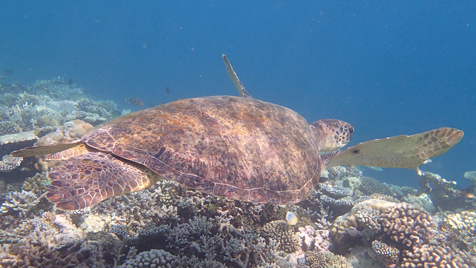 Juvenile Eretmochelys imbricata (hawksbill sea turtle), Athuruga Island, Maldives. 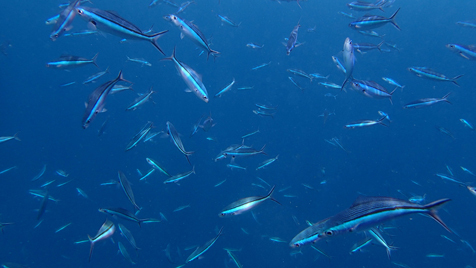 Euthynnus affinis (mackerel tuna), Athuruga Island, Maldives. 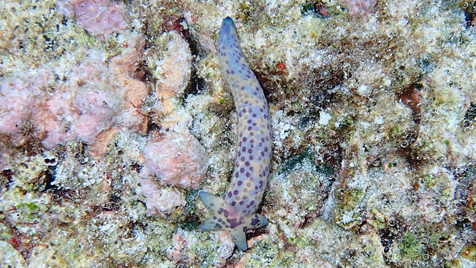 Fistularia commersonii (smooth flute-mouth), Mirihi Island, Maldives. 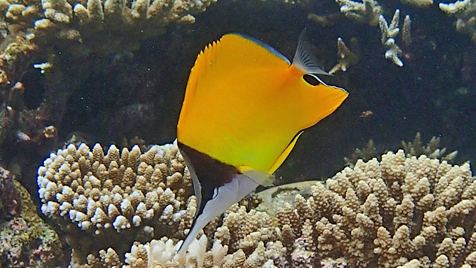 Forcipiger flavissimus (long-nose butterflyfish), Mirihi Island, Maldives. 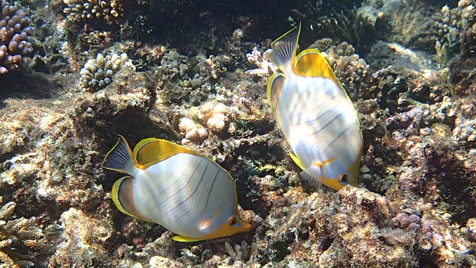 Forcipiger longirostris (big long-nose butterflyfish), Mirihi Island, Maldives. 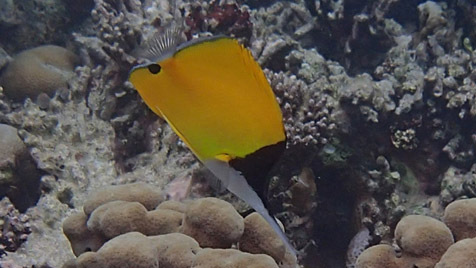 Forcipiger longirostris (a rare mutation of a big long-nose butterflyfish), Mirihi Island, Maldives. 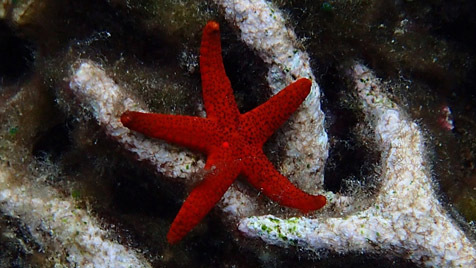 Fromia milleporella (red starfish), Athuruga Island, Maldives. 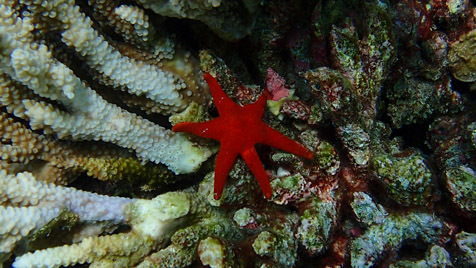 Fromia milleporella (rare six pointed red starfish), Athuruga Island, Maldives. 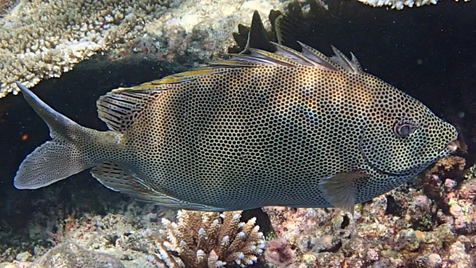 Gnathodentex aureolineatus (goldspot seabream), Athuruga Island, Maldives. 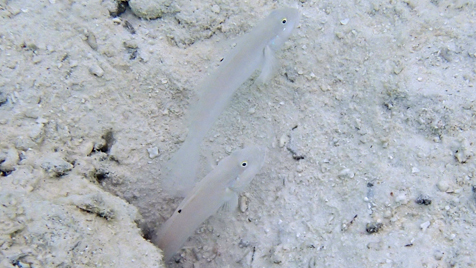 Gobiodon citrinus (citron clown goby), Mirihi Island, Maldives. 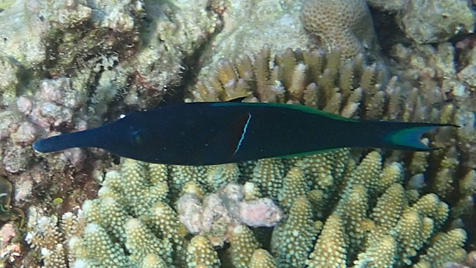 Gomphosus caeruleus (male Indian bird wrasse), Athuruga Island, Maldives. 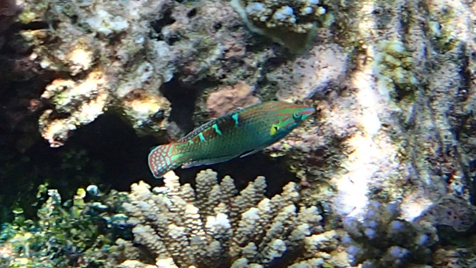 Gomphosus caeruleus (male Indian bird wrasse), Mirihi Island, Maldives. 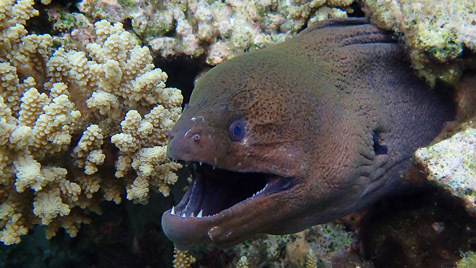 Gymnothorax javanicus (giant moray), Mirihi Island, Maldives. 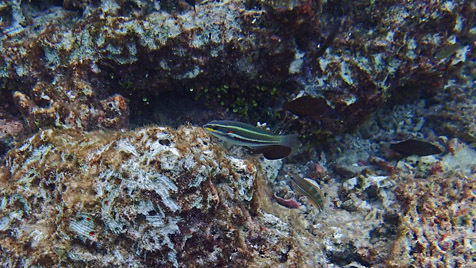 Halichoeres hortulanus (checkerboard wrasse), Mirihi Island, Maldives. 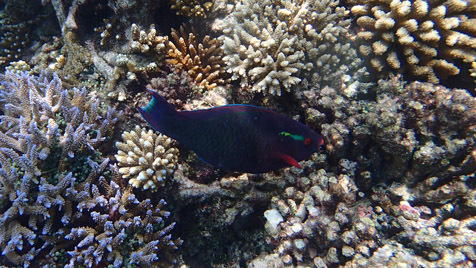 Halichoeres melanurus (Hoeven's wrasse), Mirihi, Maldives. 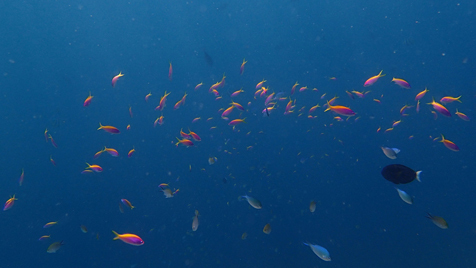 Halichoeres melanurus (Hoeven's wrasse), Athuruga, Maldives. 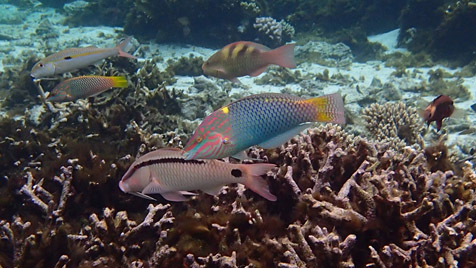 Hemigymus fasciatus (barred thicklip wrasse), Athuruga Island, Maldives. 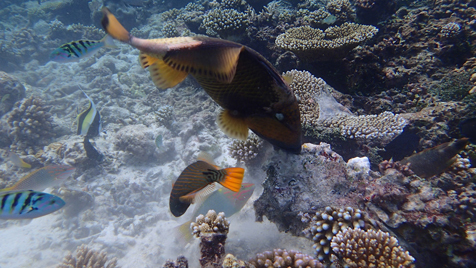 Hemigymus fasciatus (barred thicklip wrasse), Mirihi, Maldives. 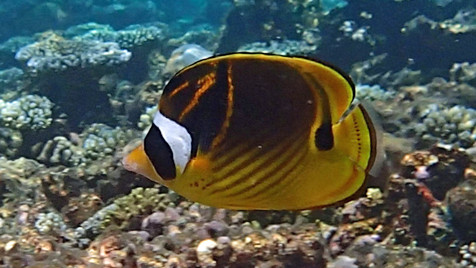 Hemitaurichthys zoster (black pyramid butterflyfish), Mirihi Island, Maldives. 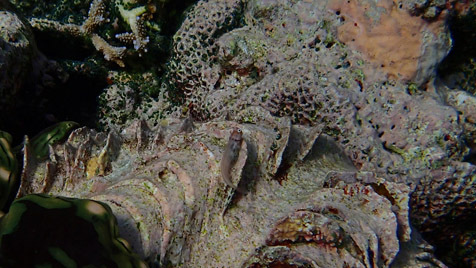 This species is found on outer reef slopes and is a plankton picker. 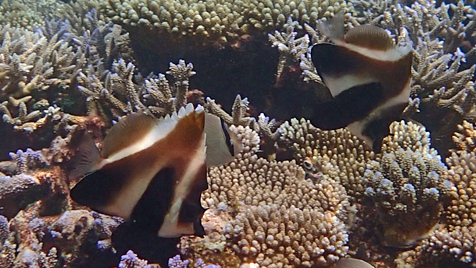 Heniochus acuminatus (black and white Heniochus or bannerfish), Athuruga Island, Maldives. 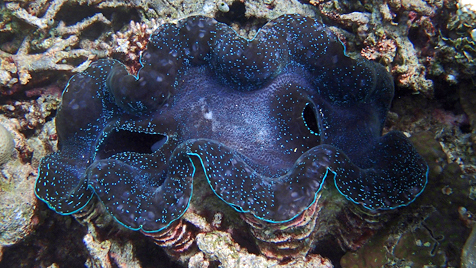 This species is found on outer reef slopes and is a plankton picker. 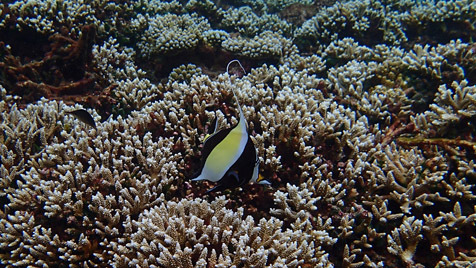 Heniochus acuminatus (black and white Heniochus or bannerfish), Athuruga Island, Maldives. 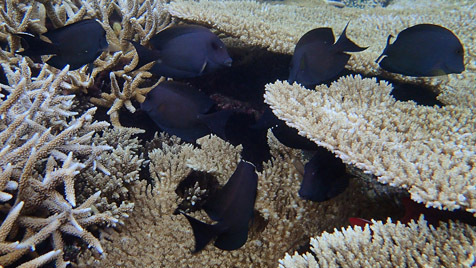 Heniochus monoceros (masked bannerfish), Athuruga Island, Maldives. 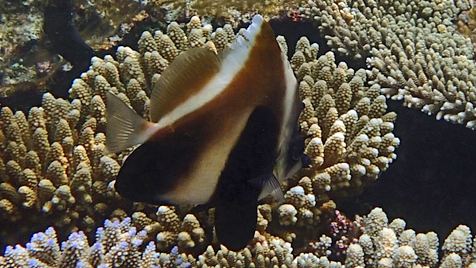 Heniochus monoceros (masked bannerfish), Mirihi Island, Maldives. 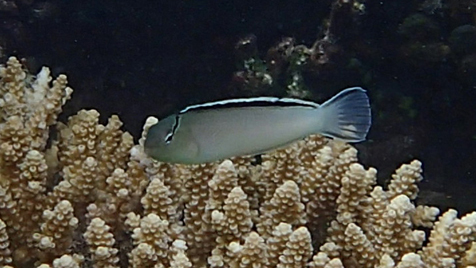 Heniochus pleurotaenia (phantom bannerfish), Mirihi Island, Maldives. 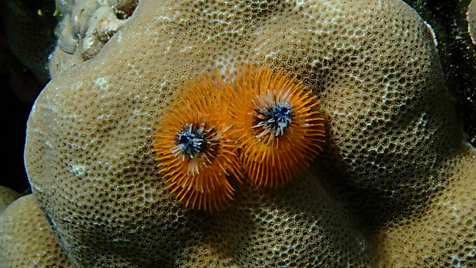 Heterocentrotus mammillatus (pencil urchin), Mirihi Island, Maldives. 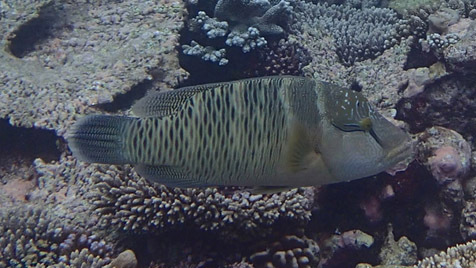 Kyphosus cinerascens (snubnose chub), Athuruga Island, Maldives. 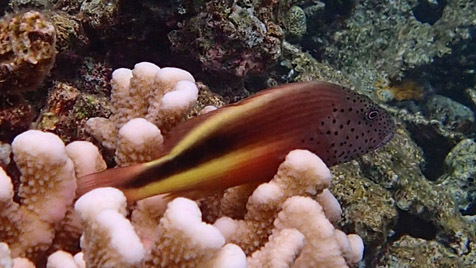 Labroides bicolor (bicolor cleaner wrasse), Athuruga Island, Maldives. 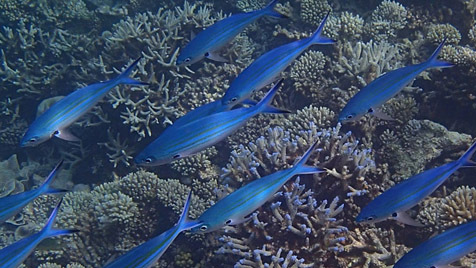 Labroides dimidiatus (bluestreak cleaner wrasse), Athuruga Island, Maldives. 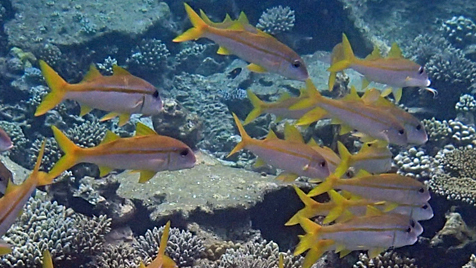 Lethrinus erythracanthus (orange-spotted emperor), Mirihi Island, Maldives. 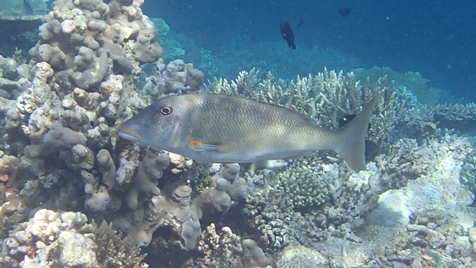 Lethrinus xanthochilus (yellowlip emperor), Athuruga Island, Maldives. 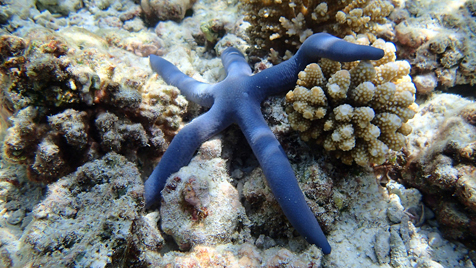 Linckia laevigata (blue linckia starfish), Athuruga Island, Maldives. 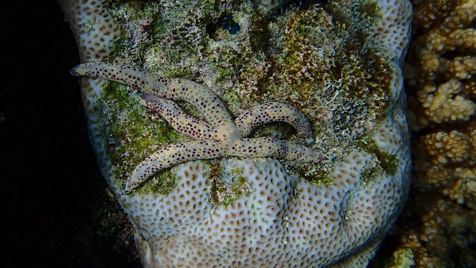 Linckia multifora (dalmation linckia starfish), Athuruga Island, Maldives. 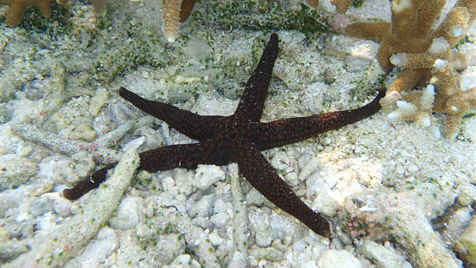 Linckia multifora (dalmation linckia starfish), Mirihi Island, Maldives. 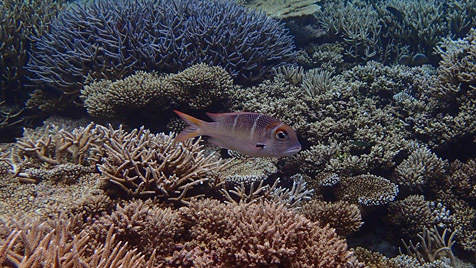 Lutjanus biguttatus (two spot snapper), Mirihi Island, Maldives. 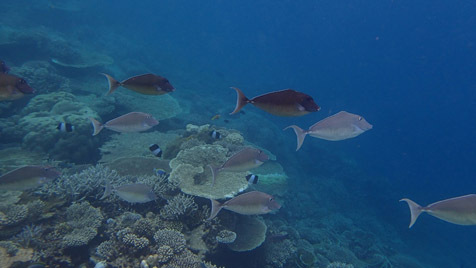 Lutjanus gibbus (humpback red snapper), Mirihi Island, Maldives. 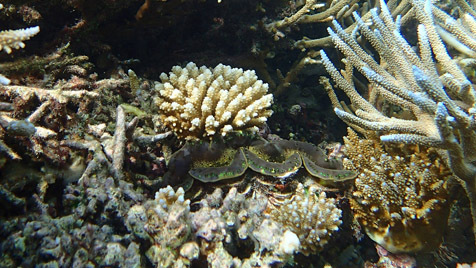 Meiacanthus smithii (disco blenny), Mirihi, Maldives. 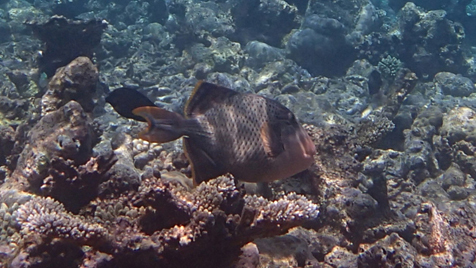 Melichthys indicus (Indian triggerfish), Mirihi Island, Maldives. 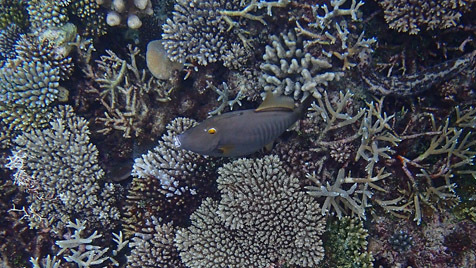 Monotaxis grandoculis (humpnose big-eye bream), Mirihi Island, Maldives. 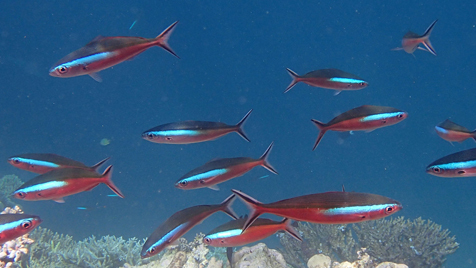 Mulloidichthys vanicolensis (yellowfin goatfish), Mirihi Island, Maldives. 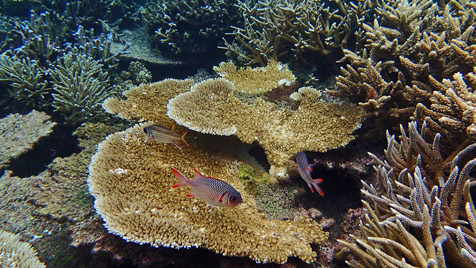 Myripristis murdjan (pinecone soldierfish), Mirihi Island, Maldives. 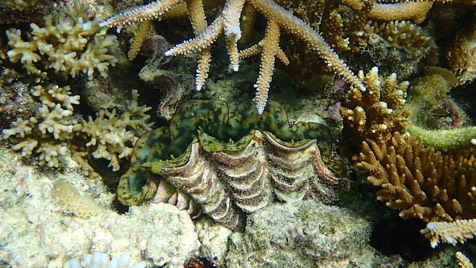 Nardoa galatheae (galathea sea star), Mirihi Island, Maldives. 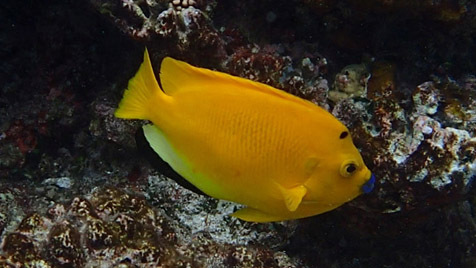 Naso elegans (blonde Naso tang), Mirihi Island, Maldives. 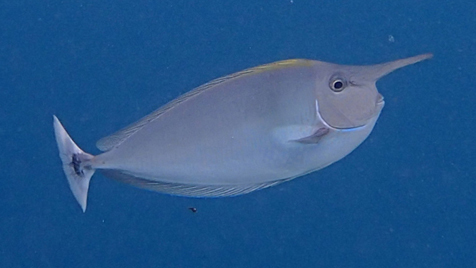 Naso brachycentron (humpback unicornfish), Mirihi Island, Maldives. 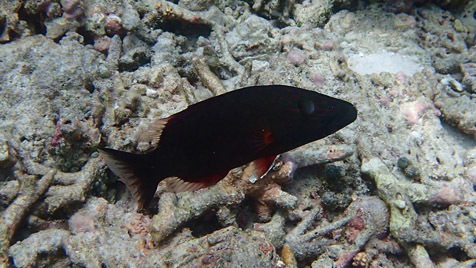 Naso hexacanthus (male blacktongue unicorn), Mirihi Island, Maldives. 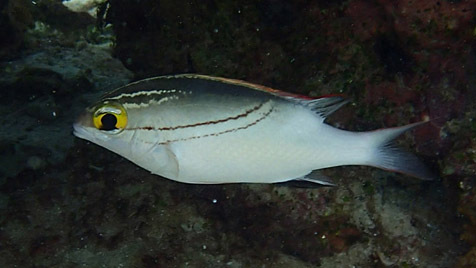 Naso hexacanthus (female blacktongue unicorn), Athuruga Island, Maldives. 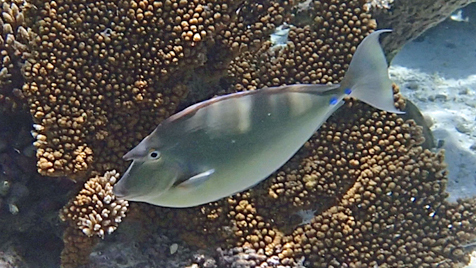 Naso unicornis (bluespine unicornfish), Athuruga Island, Maldives. 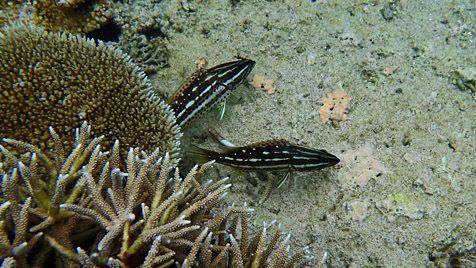 Novaculichthys taeniourus (rock mover or Dragon wrasse), Athuruga Island, Maldives. 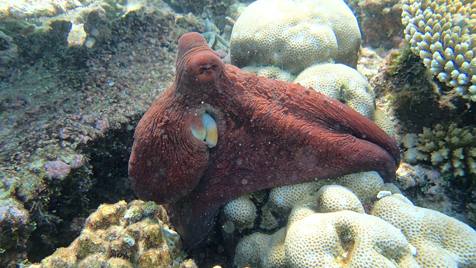 Octopus cyanea (day octopus), Athuruga Island, Maldives. 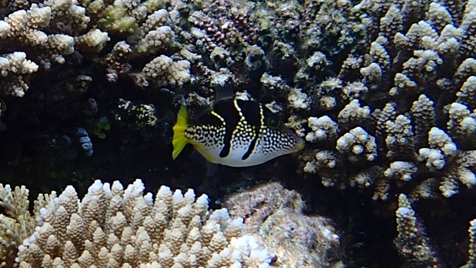 Ostracion cubicus (female yellow boxfish), Athuruga Island, Maldives. 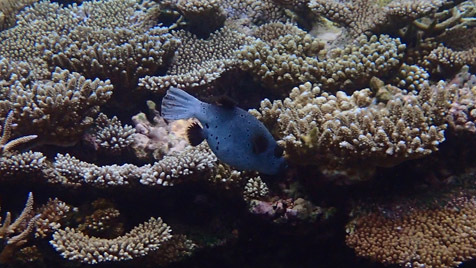 Ostracion meleagris (female white-spotted boxfish), Mirihi Island, Maldives. 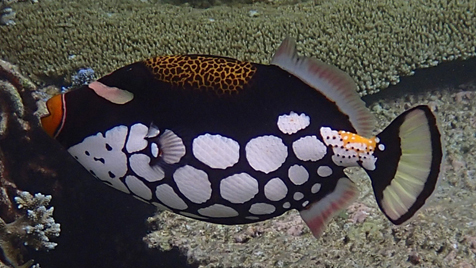 Ostracion meleagris (male white-spotted boxfish), Mirihi Island, Maldives. 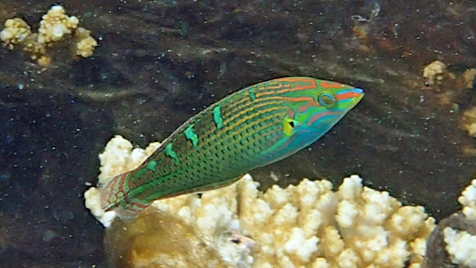 Oxycheilinus digramma (cheek-lined wrasse), Athuruga Island, Maldives. 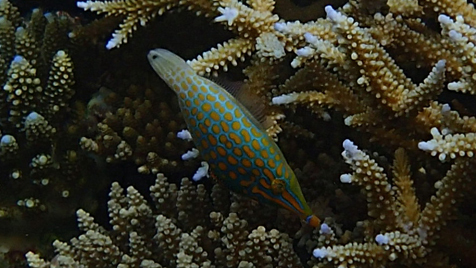 Oxymonacanthus longirostris (orangespotted filefish), Mirihi Island, Maldives. 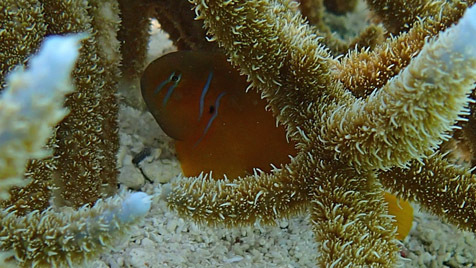 Paracirrhites forsteri (freckled hawkfish), Mirihi Island, Maldives. 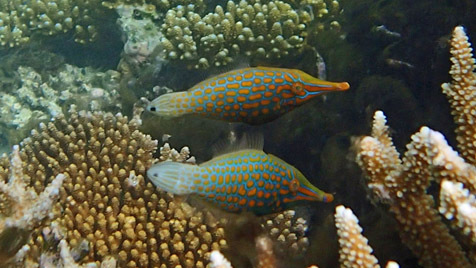 Paraluteres prionurus (blacksaddle filefish), Athuruga Island, Maldives. 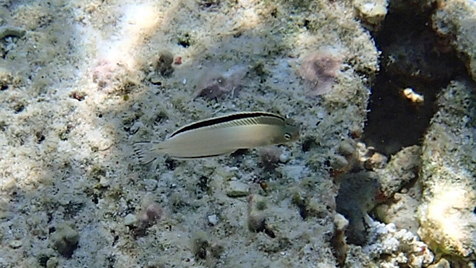 Parapercis millepunctata (blackdotted sand perch), Athuruga Island, Maldives. 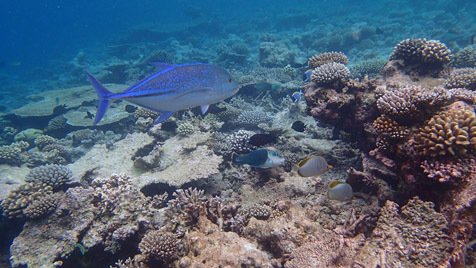 Piacanthus hamrur (moontail bullseye), Athuruga Island, Maldives. 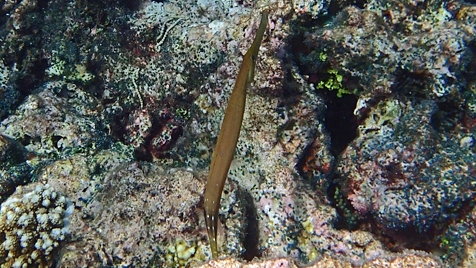 Plagiotremus phenax (imposter fangblenny), Athuruga, Maldives. 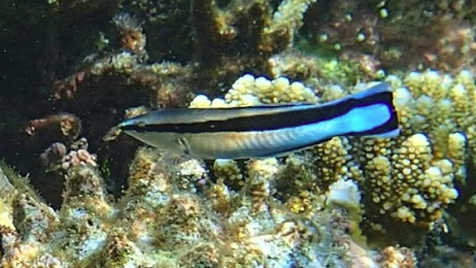 Plagiotremus rhinorhynchos (bluestriped fangblenny), Mirihi Island, Maldives. 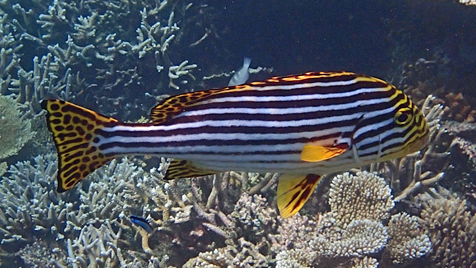 Plectorhinchus chaetodonoides (adult harlaquin or clown sweetlips), Athuruga Island, Maldives. 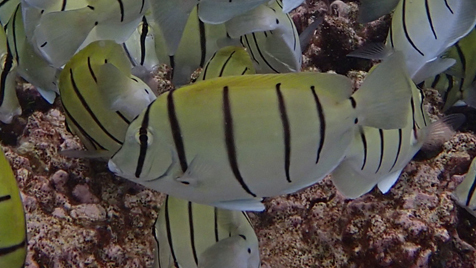 Plectorhinchus vittatus (oriental sweetlips), Mirihi Island, Maldives. 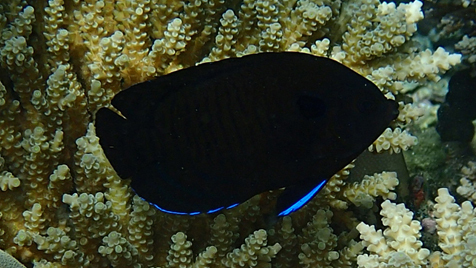 Plectroglyphidodon dickii (blackbar devil damselfish), Mirihi Island, Maldives. 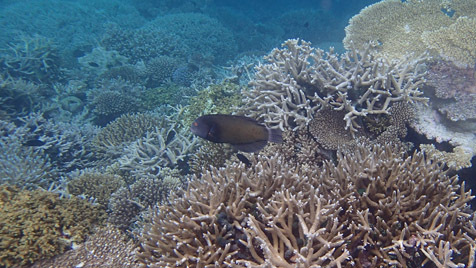 Plectropomus laevis (adult blacksaddled coral grouper), Mirihi Island, Maldives. 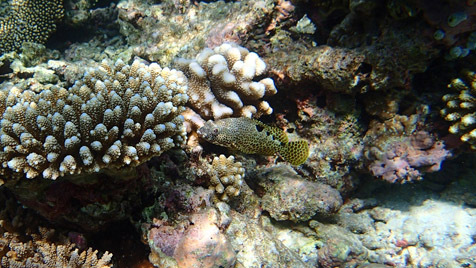 Plectropomus laevis (juvenile blacksaddled coral grouper), Mirihi Island, Maldives. 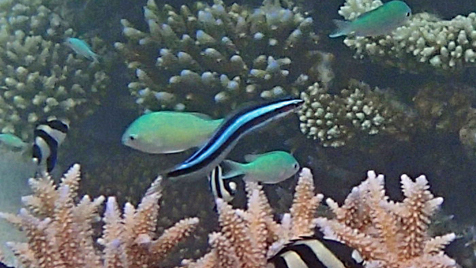 This fish gets very large, over 3 feet (1 m) and should be avoided as an aquarium fish do to its very large adult size that can be seen in the photo above this one. 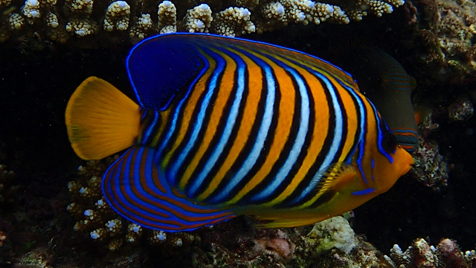 Pomacanthus imperator (emperor angelfish), Athuruga Island, Maldives. 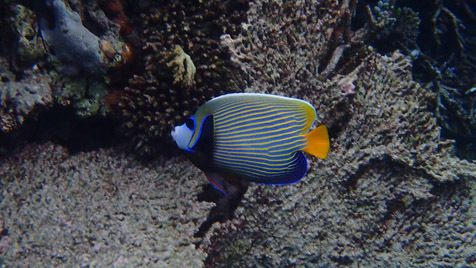 Pomacanthus imperator (emperor angelfish), Mirihi Island, Maldives. 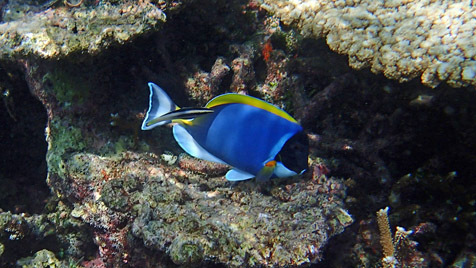 Pomacanthus xanthometopon (blueface angelfish), Athuruga Island, Maldives. 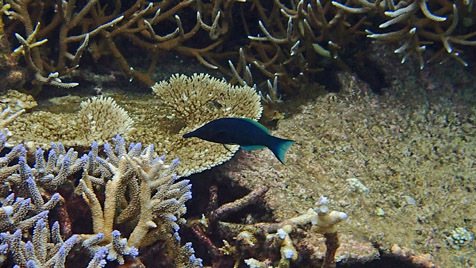 Pomacentrus caeruleus (caerulean damselfish), Athuruga Island, Maldives. 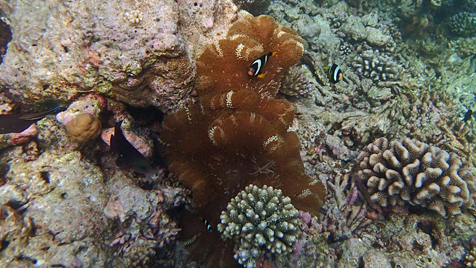 Porites lutea with Spirobranchus giganteus (Portes coral with christmas tree worms), Mirihi Island, Maldives. 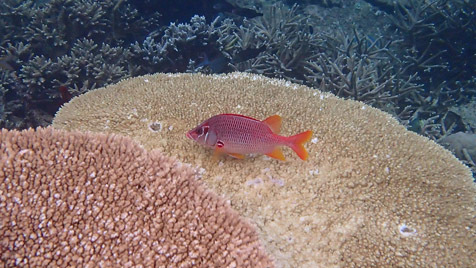 Pseudanthias evansi (evansi anthias), Athuruga Island, Maldives. 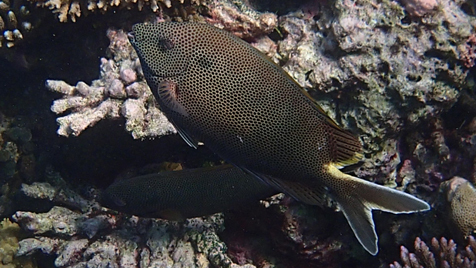 Pseudobalistes flavimarginatus (yellowmargin triggerfish), Athuruga Island, Maldives. 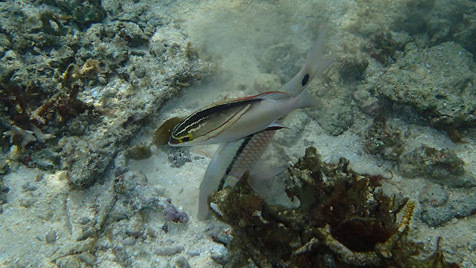 Pterocaesio tile (dark-banded fusilier, red phase), Athuruga Island, Maldives. 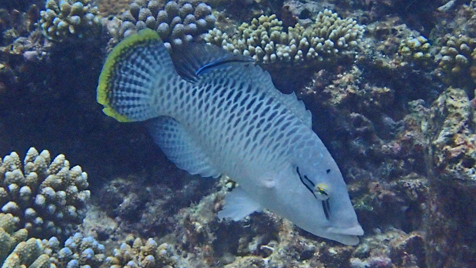 Pterocaesio tile (dark-banded fusilier), Athuruga Island, Maldives. 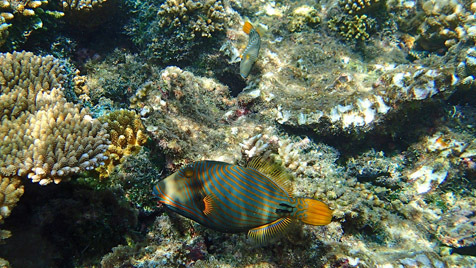 Pygoplites diacanthus (regal or royal angelfish), Mirihi Island, Maldives. 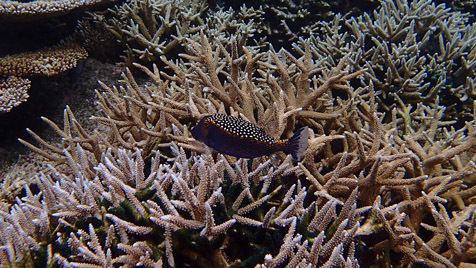 Reef at Athuruga Island, Maldives. 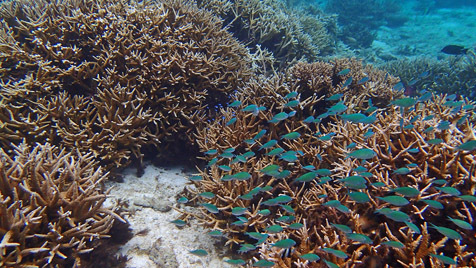 Reef at Mirihi Island, Maldives. 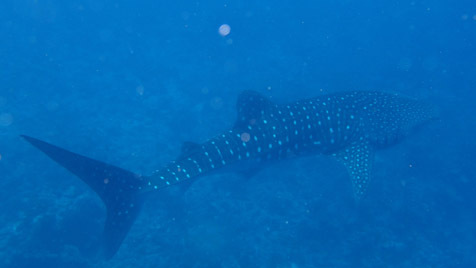 Rhincodon typus (whale shark), Nalaguraidhoo Island, Maldives. 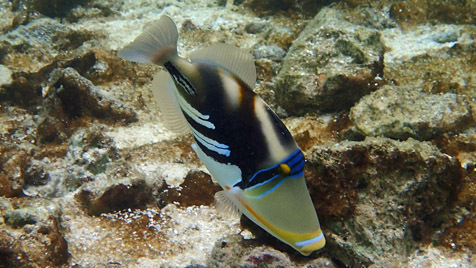 Rhinecanthus aculeatus (Picasso triggerfish), Mirihi Island, Maldives. 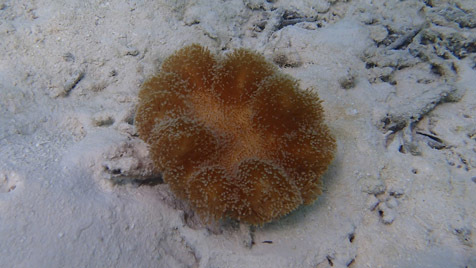 Sarcophyton trocheliophorum (toadstool coral), Mirihi Island, Maldives. 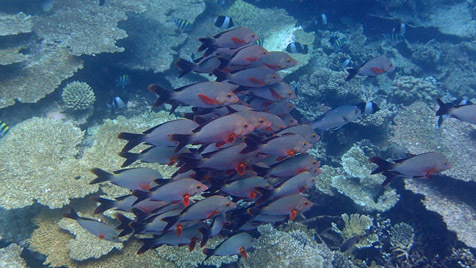 Sargocentron spiniferum (sabre squirrelfish), Mirihi Island, Maldives. 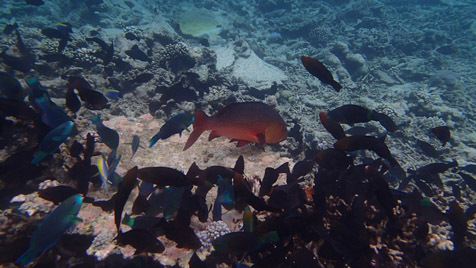 Scarus frenatus (bridled parrotfish), Athuruga Island, Maldives. 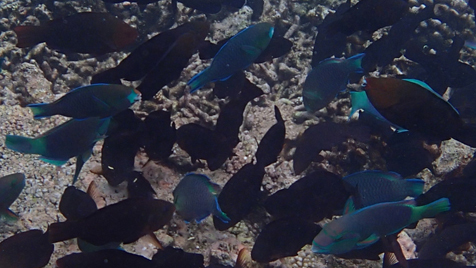 Scarus ghobban (blue-barred parrotfish, Mirihi Island, Maldives. 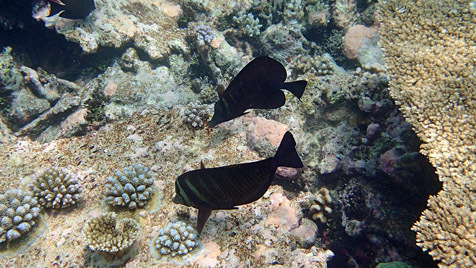 Scarus niger (dusky parrotfish), Athuruga Island, Maldives. 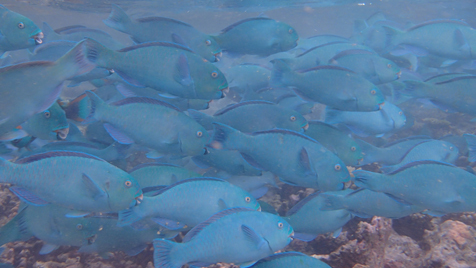 A large shoal of Scarus prasiognathos (Singapore parrotfish), Athuruga Island, Maldives. 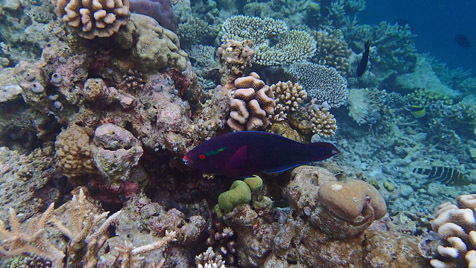 Scarus prasiognathos (female Singapore parrotfish), Athuruga Island, Maldives. 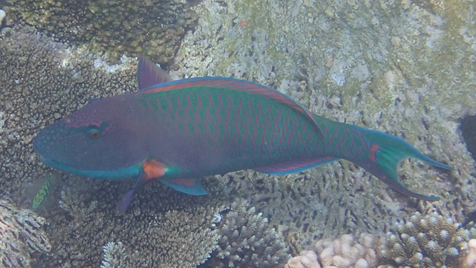 Scarus prasiognathos (male Singapore parrotfish), Mirihi Island, Maldives. 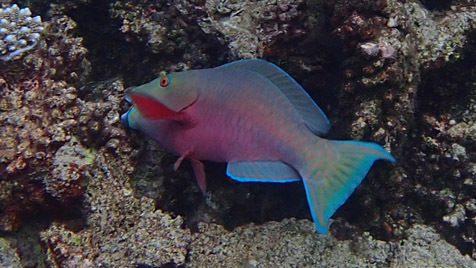 Scarus rubroviolaceus (female ember parrotfish), Athuruga Island, Maldives. 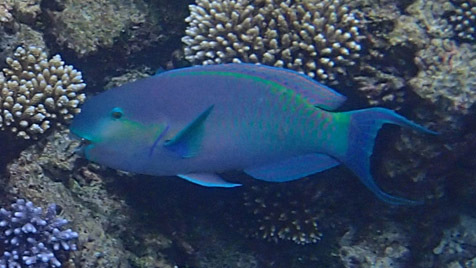 Scarus rubroviolaceus (male ember parrotfish), Athuruga Island, Maldives. 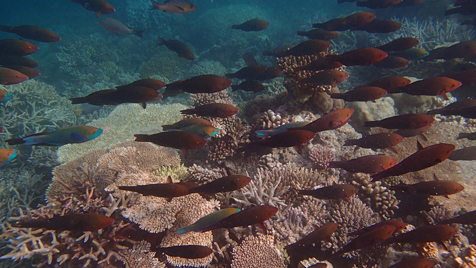 A shoal of Scarus sordidus (bullethead parrotfish), Mirihi Island, Maldives. 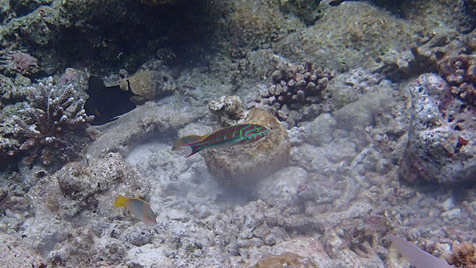 Scolopsis sp, with Parupeneus barberinus (dash-and-dot goatfish), Mirihi Island, Maldives. 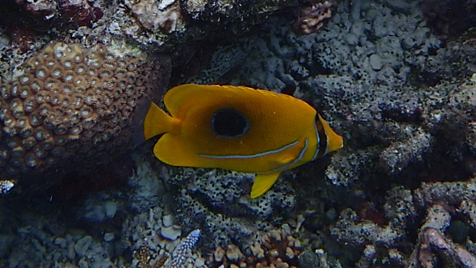 but it has a red dorsal and yellow eye, Mirihi Island, Maldives. 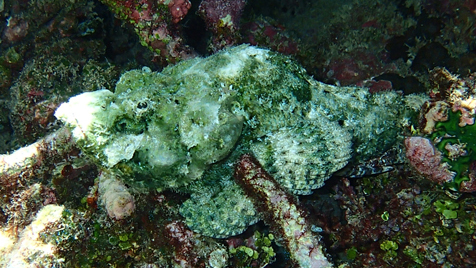 Scorpaenopsis diabolus (green false stonefish or devil scorpionfish), Athuruga Island, Maldives. 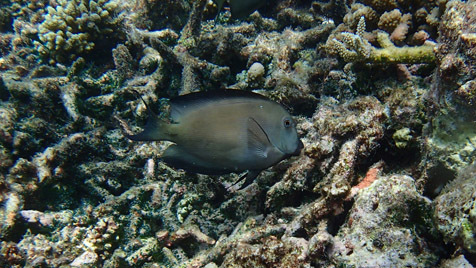 Siganus puelloides (blackeye rabbitfish), Mirihi Island, Maldives. 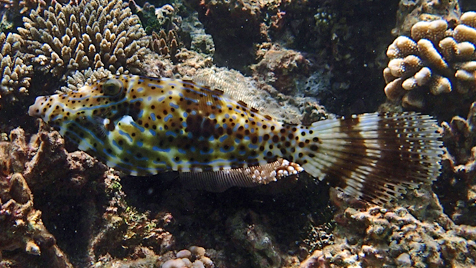 Siganus stellatus (brown-spotted rabbitfish), Athuruga Island, Maldives. 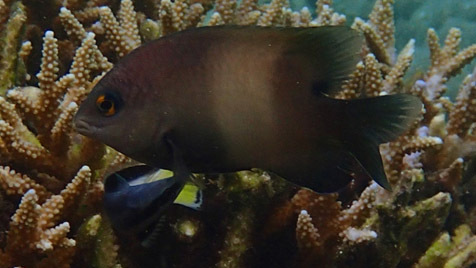 Stegastes nigricans (dusky farmer damselfish or dusky gregory) being cleaned by a Labroides bicolor (bicolor cleaner wrasse), Mirihi Island, Maldives. 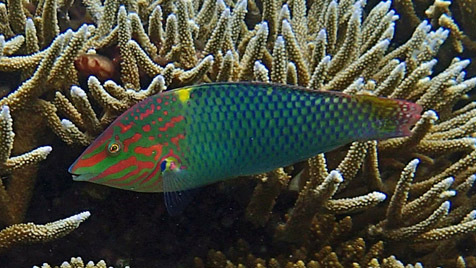 Stethojulis bandanensis (juvenile red shoulder wrasse), Athuruga Island, Maldives. 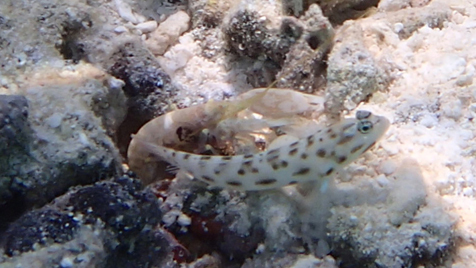 Synodus variegatus (variegated lizardfish), Mirihi Island, Maldives. 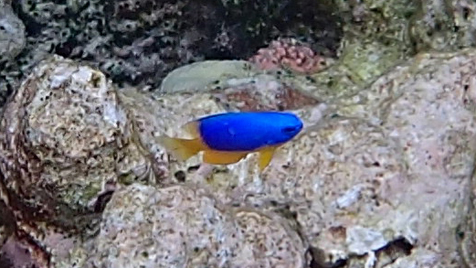 Thalassoma sp. 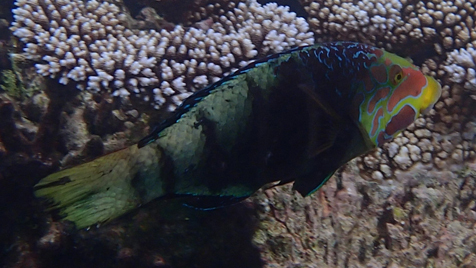 (undescribed wrasse? 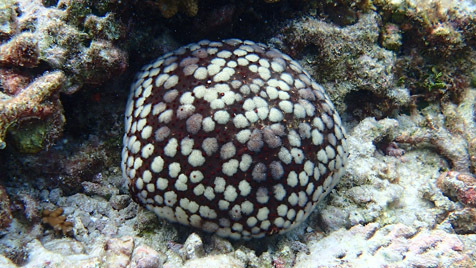 It's not quinquevittatum), Athuruga Island, Maldives. 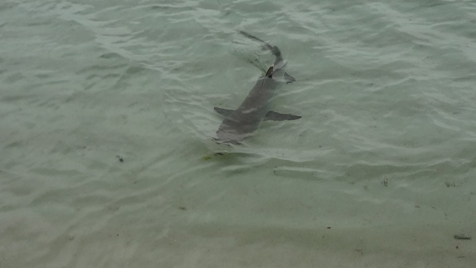 Triaenodon obesus (white-tip reef shark) just feet from the beach at Mirihi Island, Maldives. 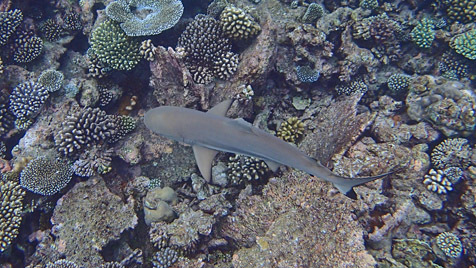 Triaenodon obesus (white-tip reef shark), Mirihi Island, Maldives. 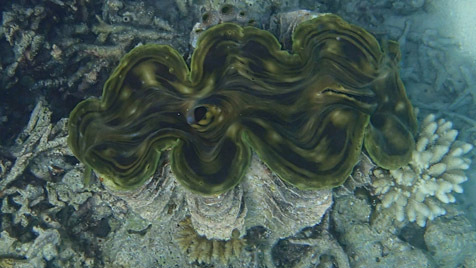 Tridacna maxima (maxima clam), Mirihi Island, Maldives. 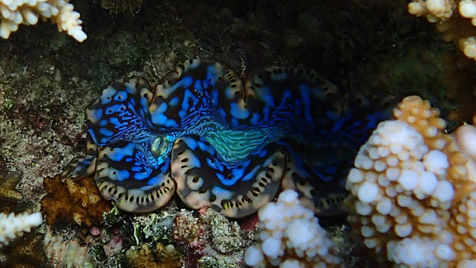 Tridacna maxima (maxima clam), Athuruga Island, Maldives. 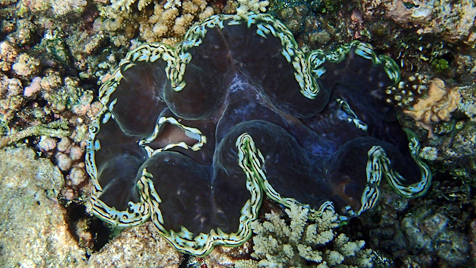 Tridacna squamosa (fluted giant clam), Athuruga Island, Maldives. 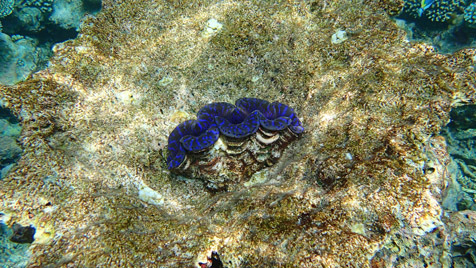 Tridacna squamosa (fluted giant clam) Mirihi Island, Maldives. 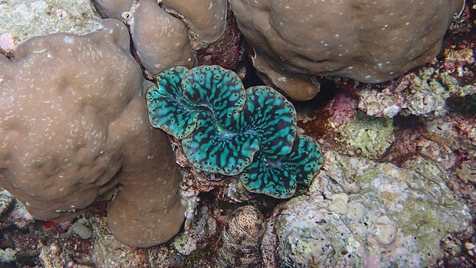 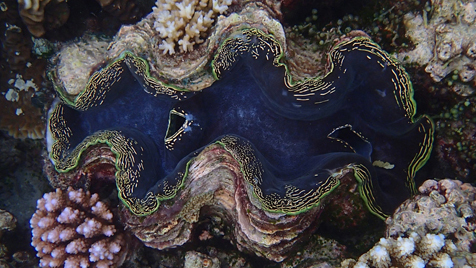 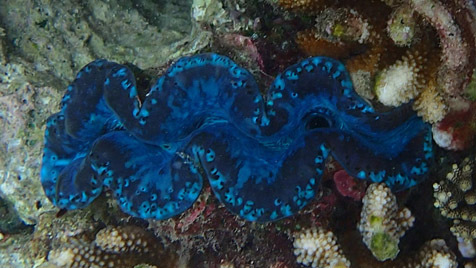 Tridacna squamosa (fluted giant clam), Mirihi Island, Maldives. 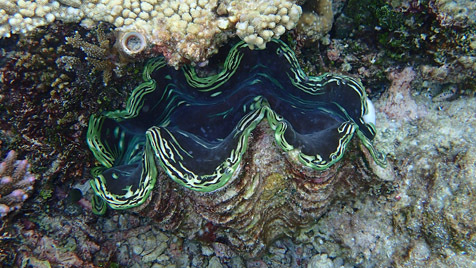 Tridacna squamosa (fluted giant clam) Athuruga Island, Maldives. 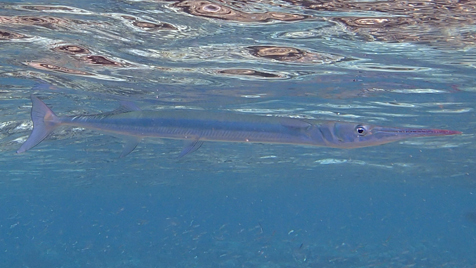 Tylosurus acus (agujon needlefish), Athuruga Island, Maldives. 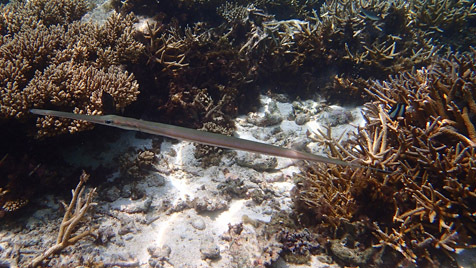 Tylosurus crocodilus (crocodile needlefish), Athuruga Island, Maldives. 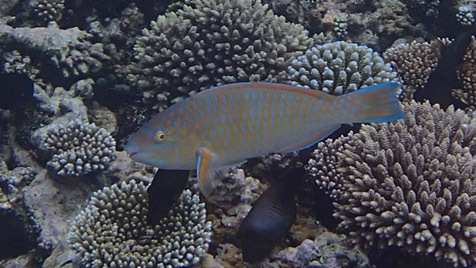 Pseudodax moluccanus (chiseltooth wrasse) in terminal phase color, Mirihi Island, Maldives. 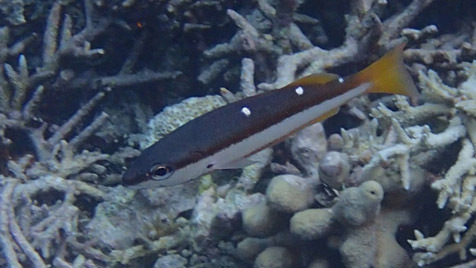 Valenciennea sexguttata (sixspot goby), Athuruga Island, Maldives. 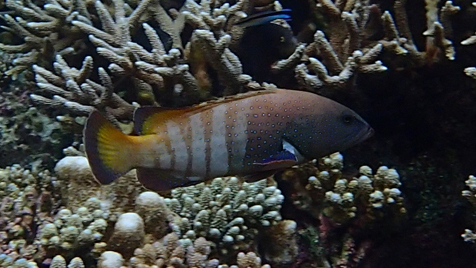 Variola louti (yellow-edged lyretail grouper), Mirihi Island, Maldives. 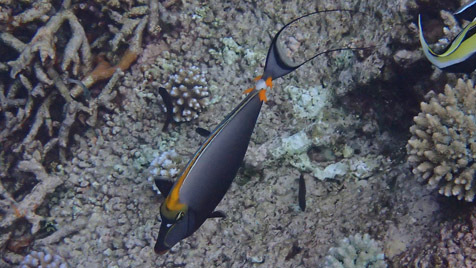 Zanclus cornutus (moorish idol), Mirihi Island, Maldives. 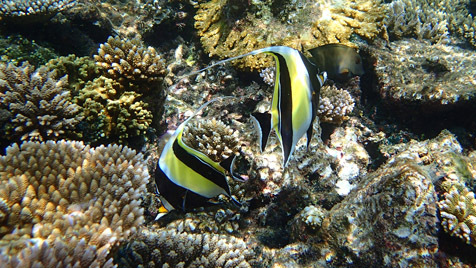 Zanclus cornutus (moorish idol), Athuruga Island, Maldives. 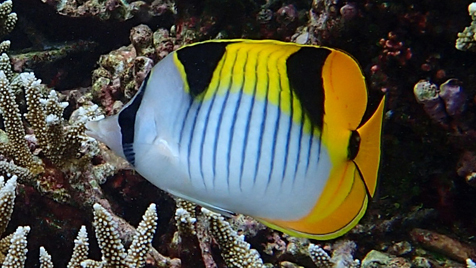 Zebrasoma desjardini (Indian Ocean sailfin tang), Mirihi Island, Maldives. 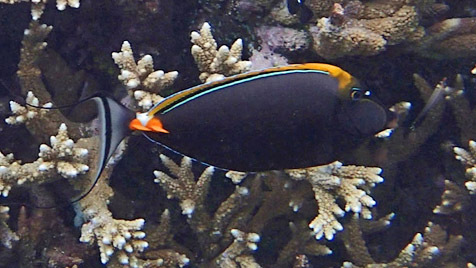 Zebrasoma desjardini (a rare color mutation of a Indian Ocean sailfin tang), Athuruga Island, Maldives. 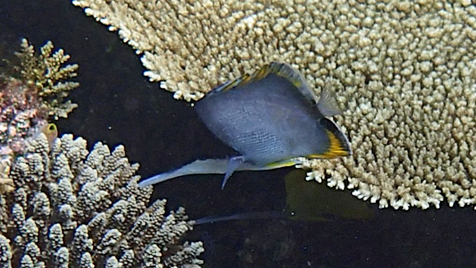 Zebrasoma scopas (scopas tang) being cleaned by Labroides dimidiatus (bluestreak cleaner wrasse), Athuruga Island, Maldives.